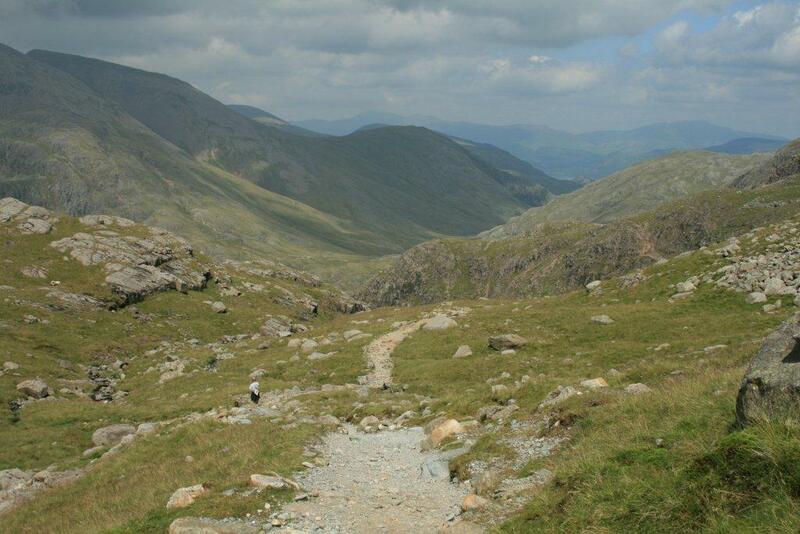 Latrigg is an iconic Lakeland fell- walk and one of the lowest fells in the Lake District. 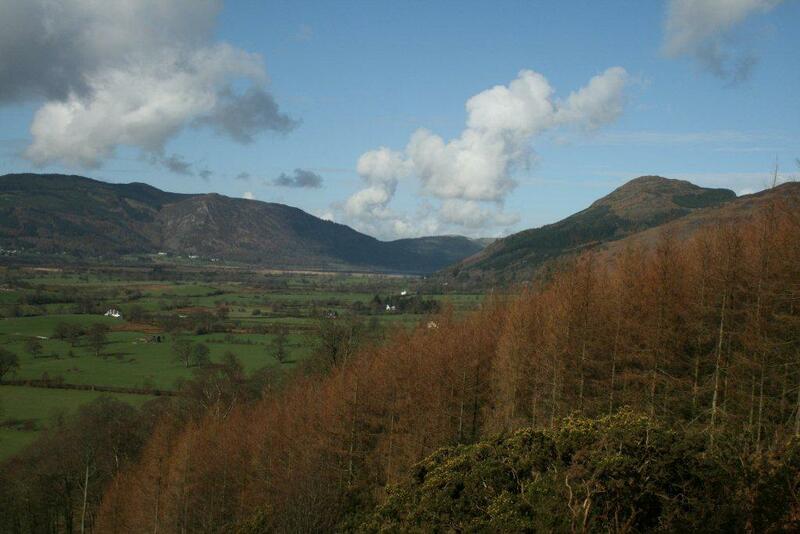 It’s an all year round climb, which is very popular due to its convenient location overlooking the town of Keswick. 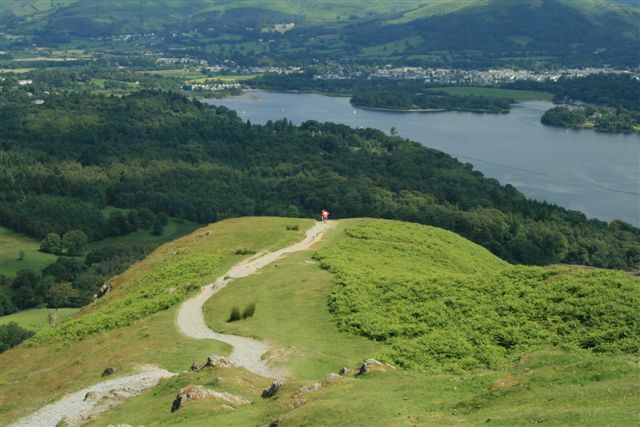 The summit of Latrigg rewards the walker with beautiful views down the Borrowdale valley, Derwent Water and Bassenthwaite Lake, and the Helvellyn range can be seen. 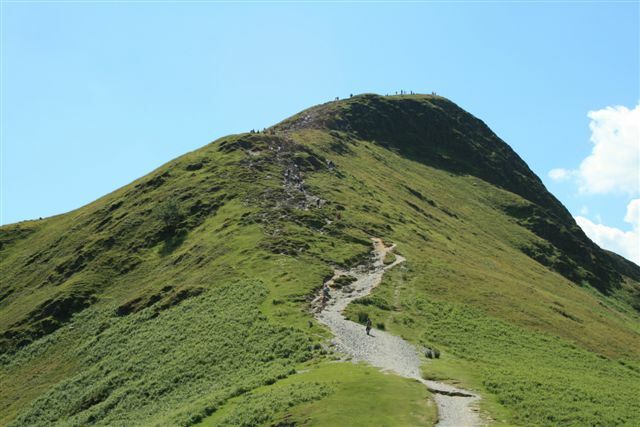 You can start a walk to the summit of Latrigg from practically anywhere within the town of Keswick and its multitude of Guest Houses with good parking available throughout. 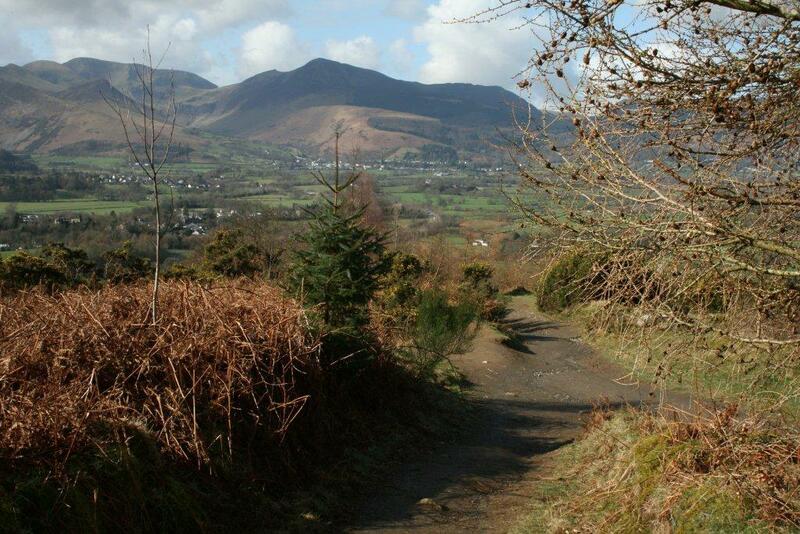 Walking from the leisure pool making your way to Spooney Green Lane, a bridleway is clearly signposted leading to Skiddaw. 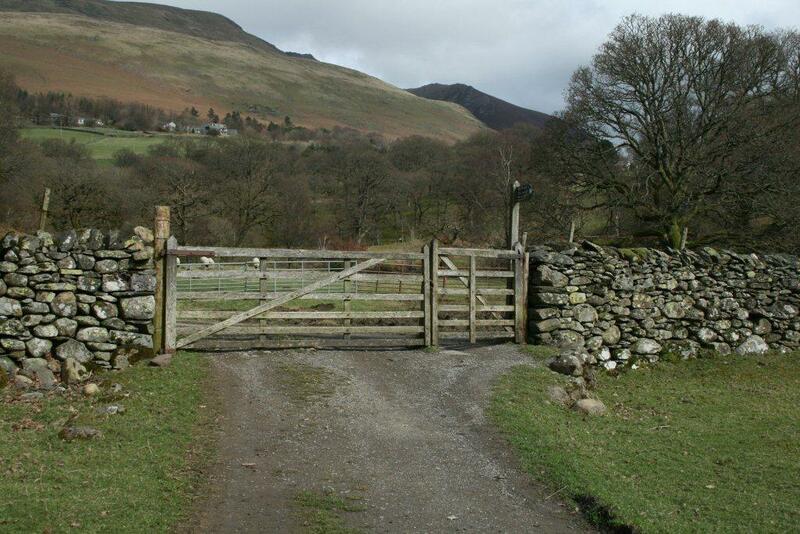 The bridleway crosses the A66 and makes its way to a wooden 5 bar gate and kissing gate. 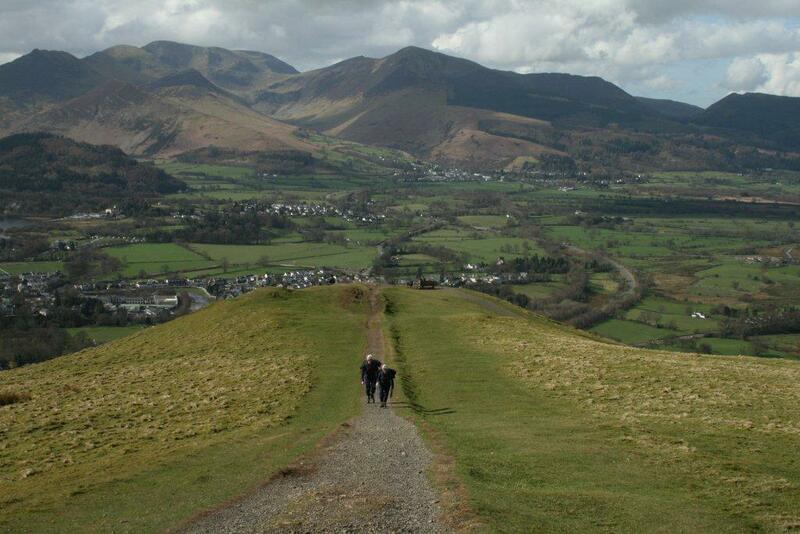 Passing through the gate the path ascends the western slopes of Latrigg with views towards Skiddaw and Bassenthwaite Lake. 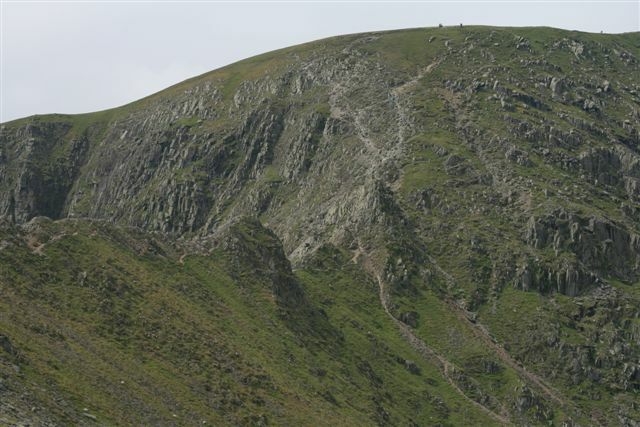 The total ascent of Latrigg is approximately 1,000 feet with the main footpath following the western flank before it turns back towards Keswick and the summit. For many the challenge of Latrigg is to ascend by the more strenuous routes which are not on the Ordnance Survey maps. 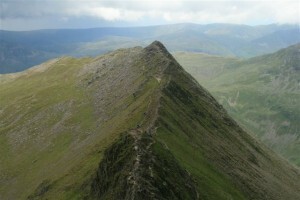 Along these routes you may even find people out running from Keswick to the summit and back again!! 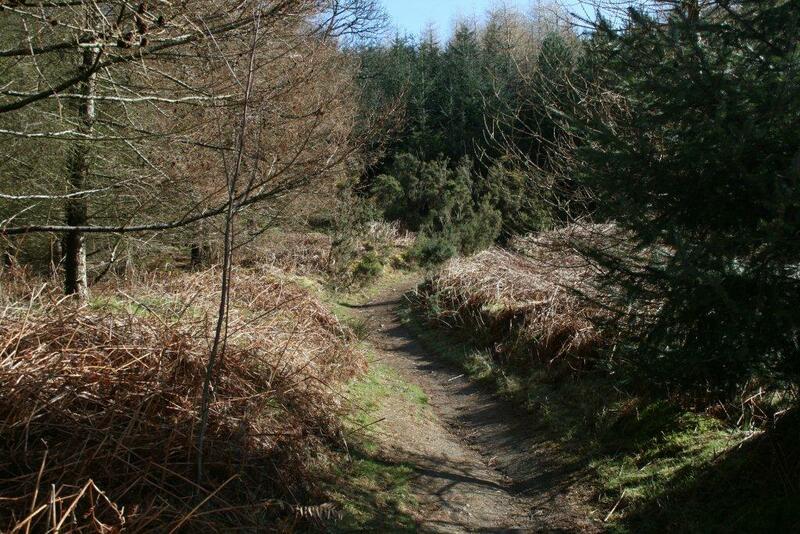 As you follow the footpath upwards you will come to a small island and here you can leave the well trodden Ordnance Survey route and head off North Easterly through the pine trees. 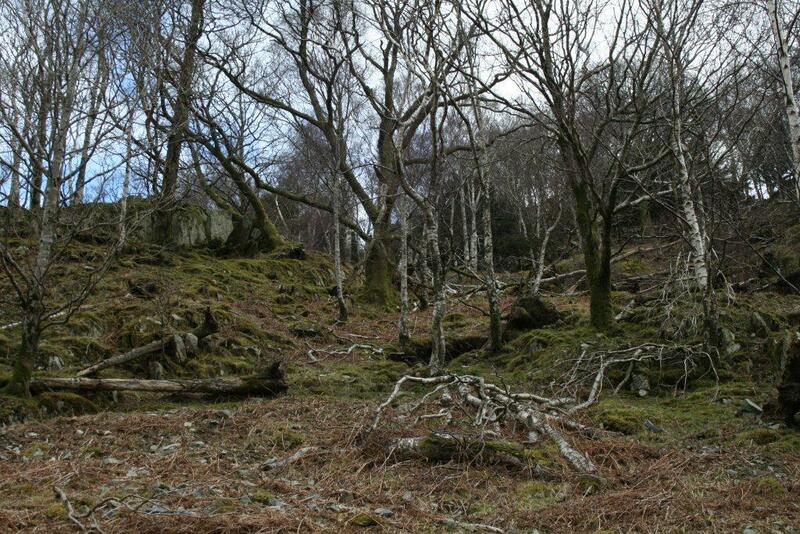 We followed this route which traversed the fell until we came to the end of the woodland area and a fence line. 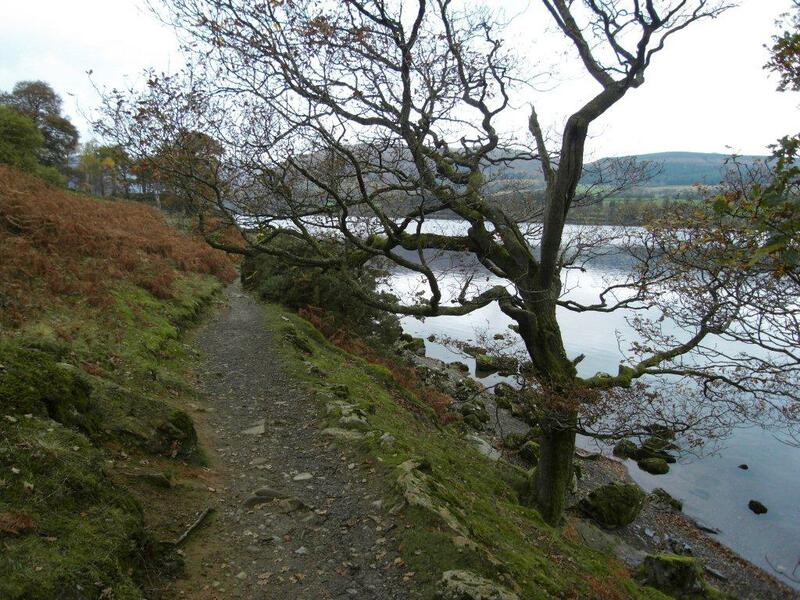 Along this path there are some wonderful views of Keswick and Derwent Water. Upon reaching the fence we jumped over and followed it until we reached a gate on our left. 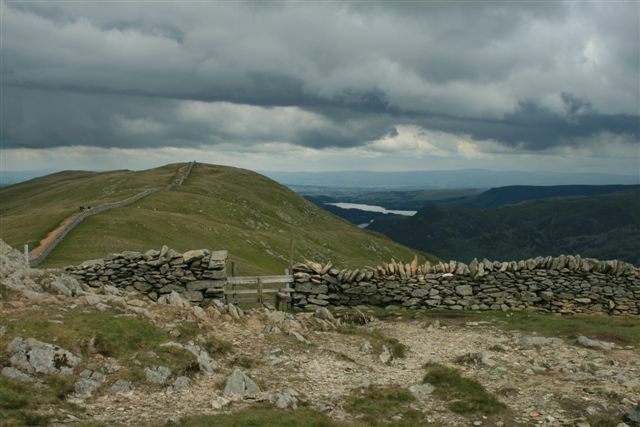 Once through the gate it is a short walk to the summit of Latrigg and the small wooden bench seat which marks the summit. On a quiet day you may find the seat empty but we where not so lucky. 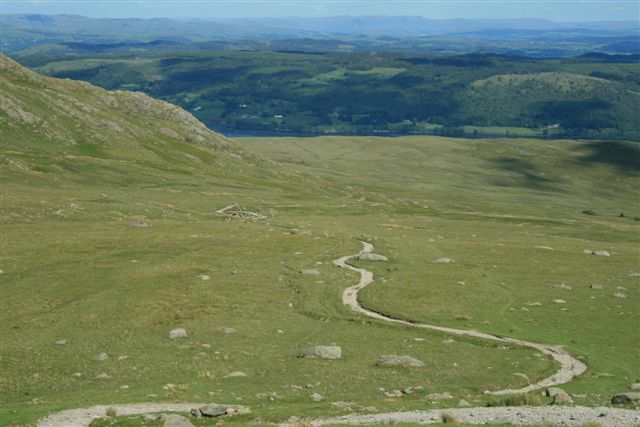 Look for a path, which turns acutely off to the right from the main Ordnance Survey track and follow this as it gracefully and partially zigzags a course to the summit of Latrigg. 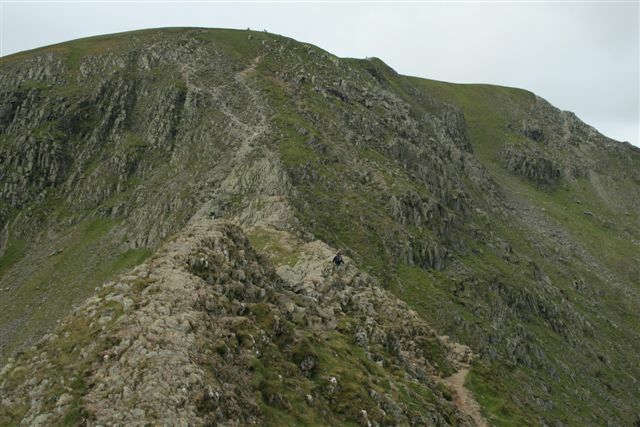 On leaving Latrigg following the summit ridge North Easterly towards Blencathra and Threlkeld returning back the way we had climbed from our original approach via the fence line. 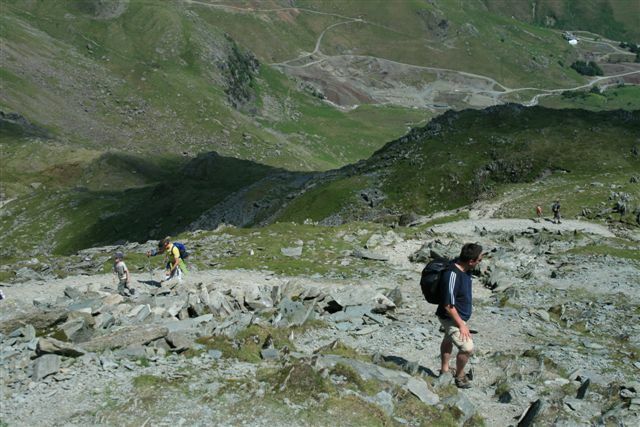 Here the footpath is easily followed and on good ground as you make your way downwards and onto the road. 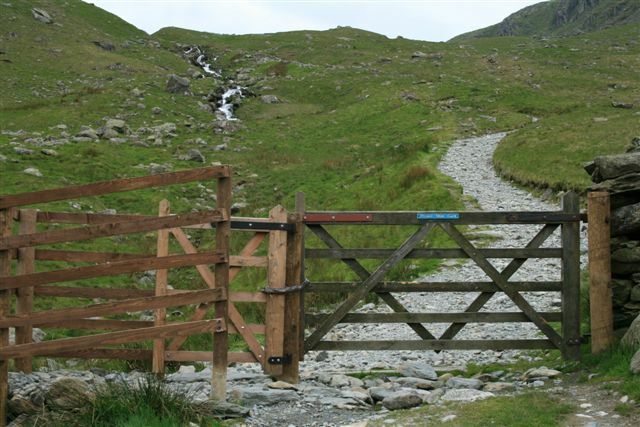 To make for a longer and more interesting walk we continued downwards onto the disused Keswick railway walk which is distinguished by a 5 bar gate, with a kissing gate adjacent. 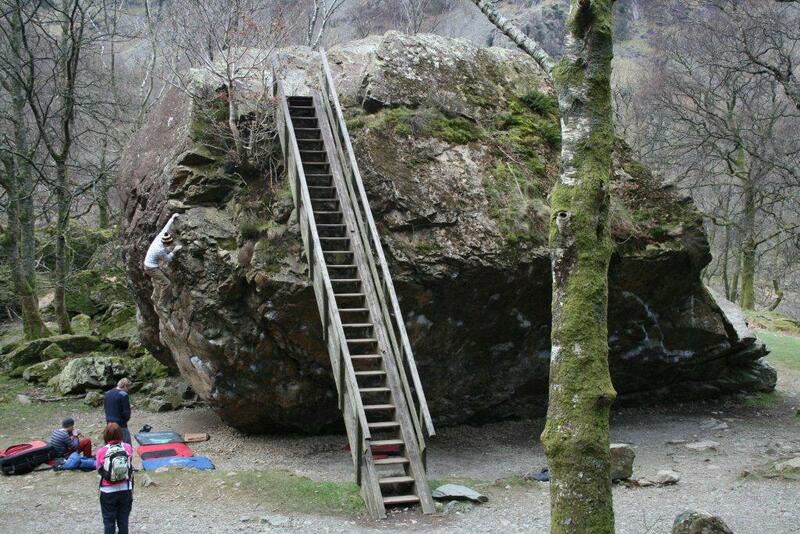 There is also a sign post here. 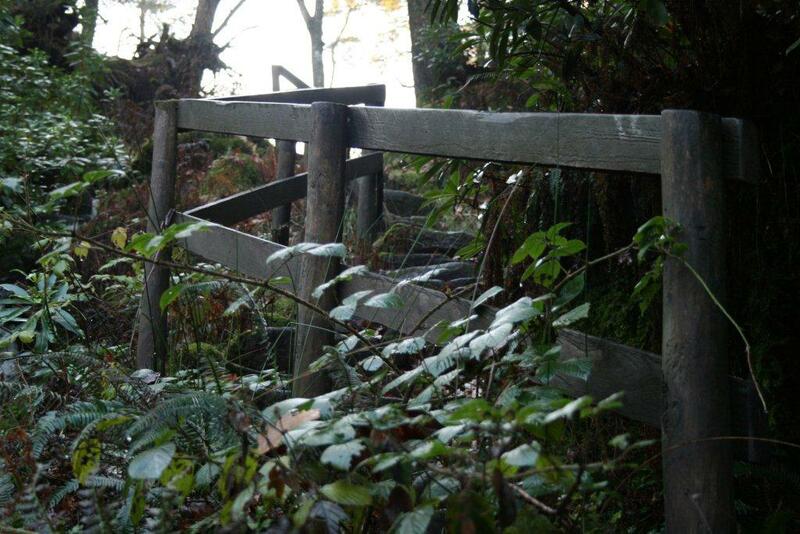 Also of note is the fact that you should be able to see a wonderful old railway bridge from the gate and sign post. 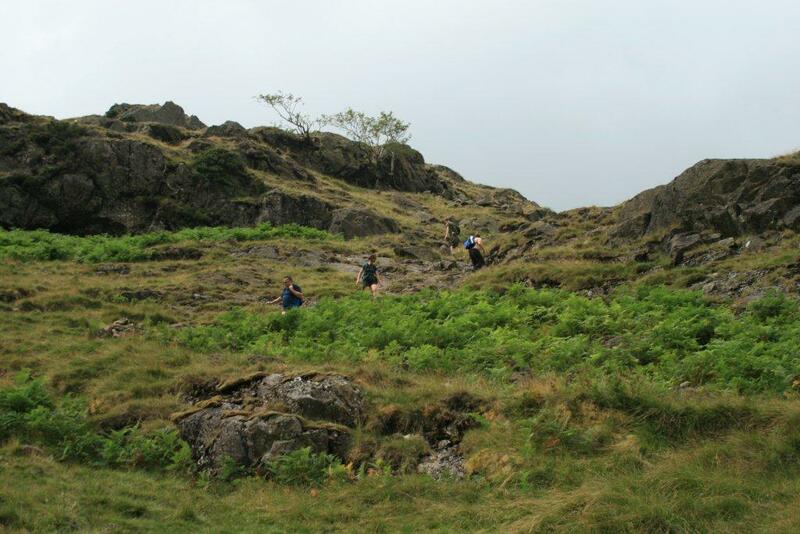 There is also a shelter of stone construction in which you will find the Cumbrian way of spelling 1 through 10. 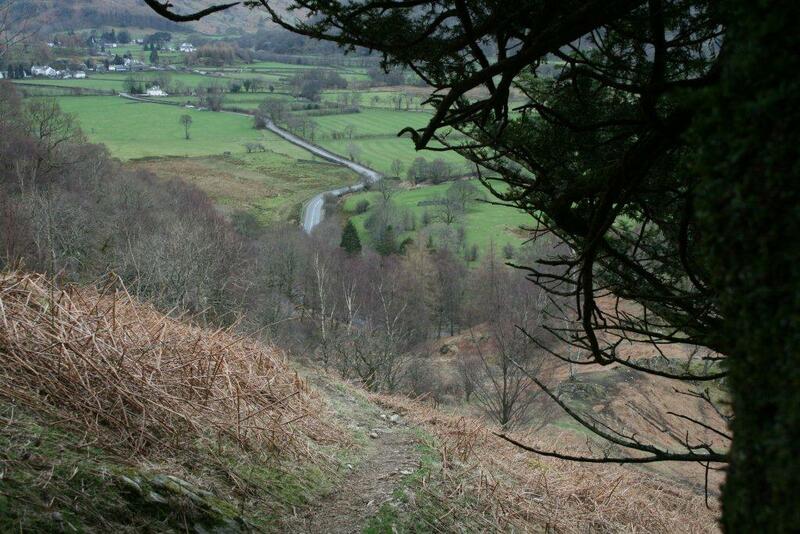 Taking the railway footpath we continued on our walk away from Keswick and headed towards the Lakeland village of Threlkeld. 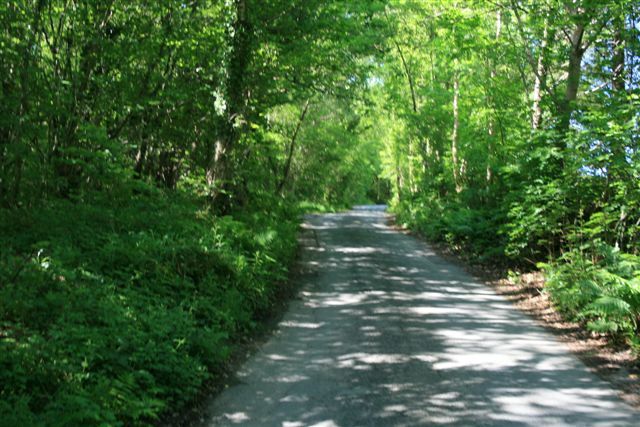 You will find the railway path to be good quality and relatively flat, making it good for cyclists and walkers. 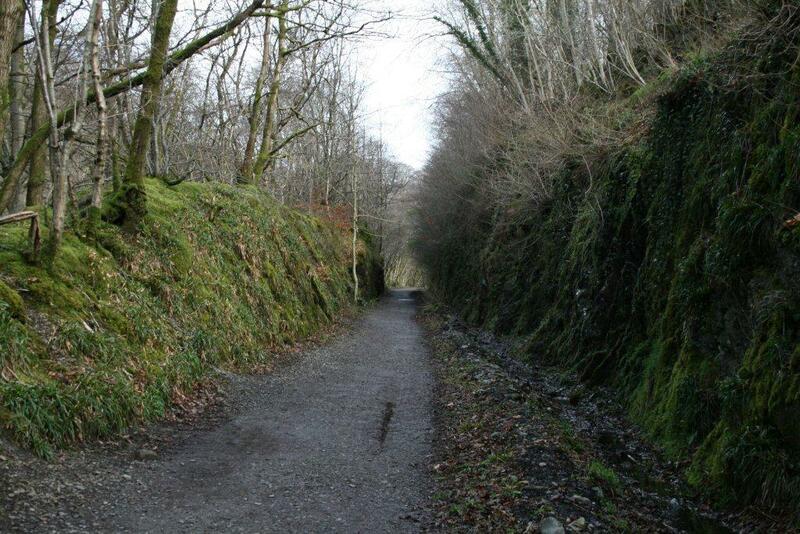 The railway footpath is approximately 3 miles long and was created by the Lake District Park Authority following the acquisition of part of the former Cockermouth, Keswick and Penrith Railway which closed in 1972. 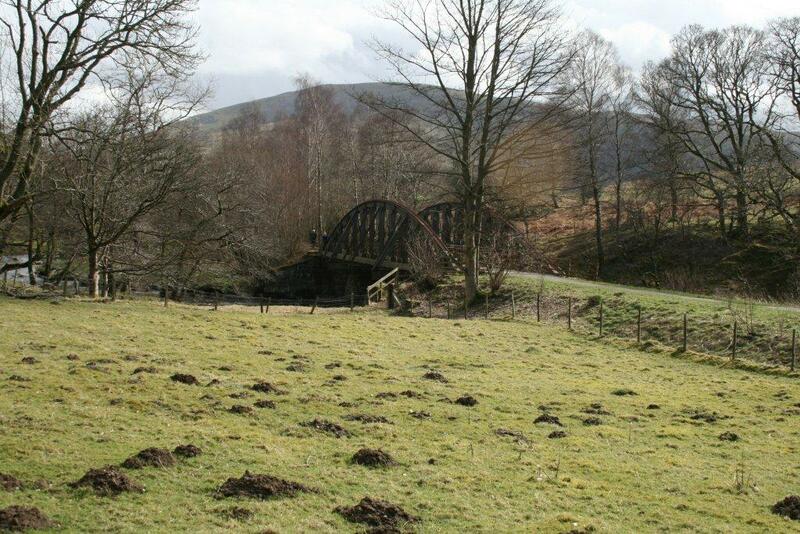 Over the railway footpaths 3 mile length between Threlkeld and Keswick there are 8 redundant old railway bridges which cross over the River Greta making this a wonderful walk. 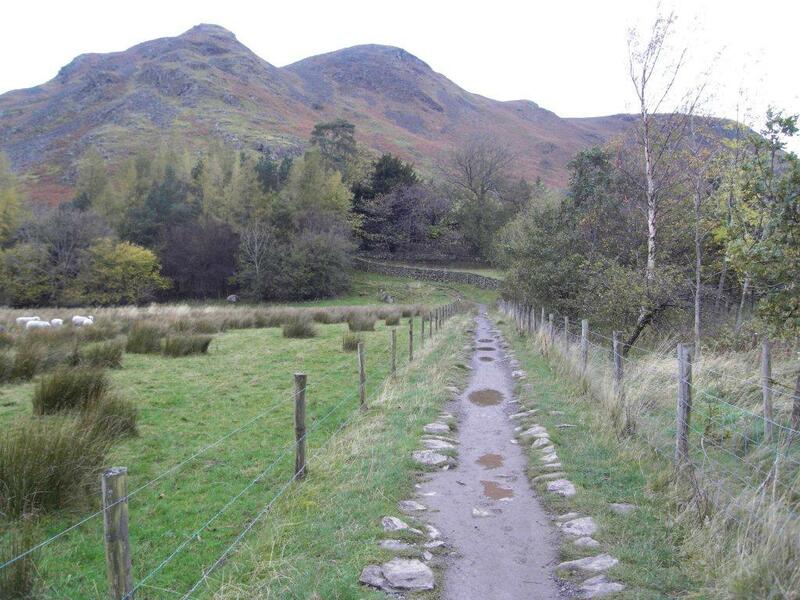 We followed the railway footpath until it met the A66 and here we turned off and walked along the main through fare through the village of Threlkeld until we arrived at the Horse and Farrier where we had our lunch. 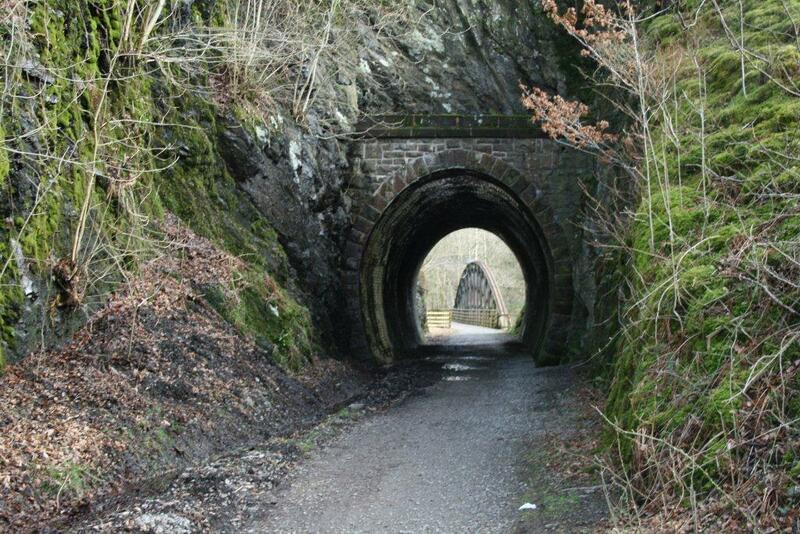 After lunch we returned the way we had come back down to the railway line path and walked along its length back in to Keswick. 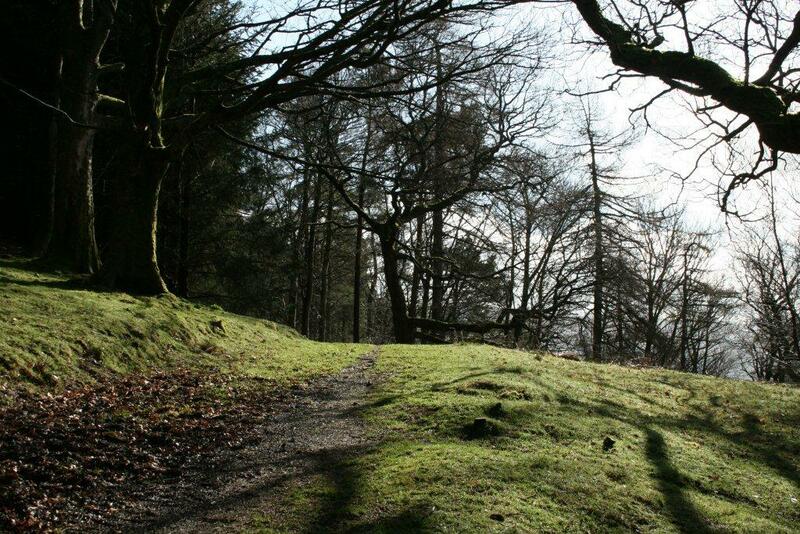 Should you wish to see better quality photographs of Latrigg Walk please visit Latrigg Walk on our Lake District Walks Flickr account. 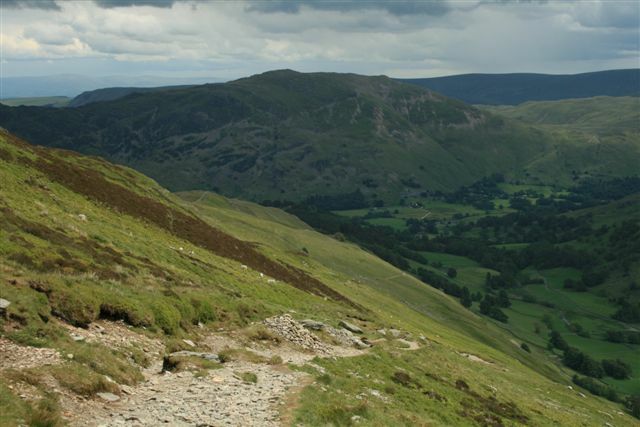 Latrigg is a great easy walk for all to enjoy. 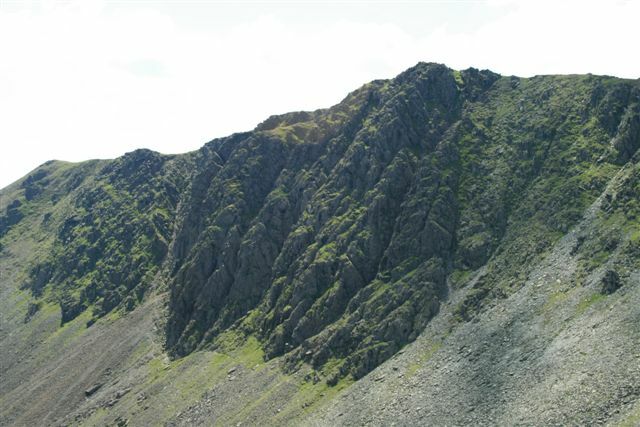 Scafell Pike is the highest mountain in England at 3,209 ft (978 metres) and is located within the Southern Fells of The Lake District National Park, Cumbria. 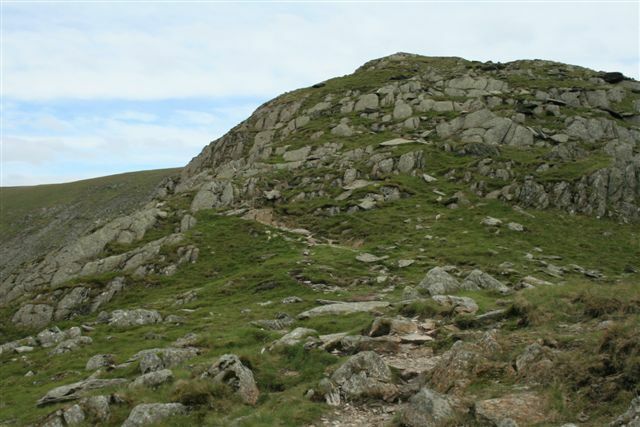 There are many possible variations of route for the ascent of Scafell Pike, all a challenging proposition and a good days walking, though you would expect nothing less of England’s highest mountain, right? 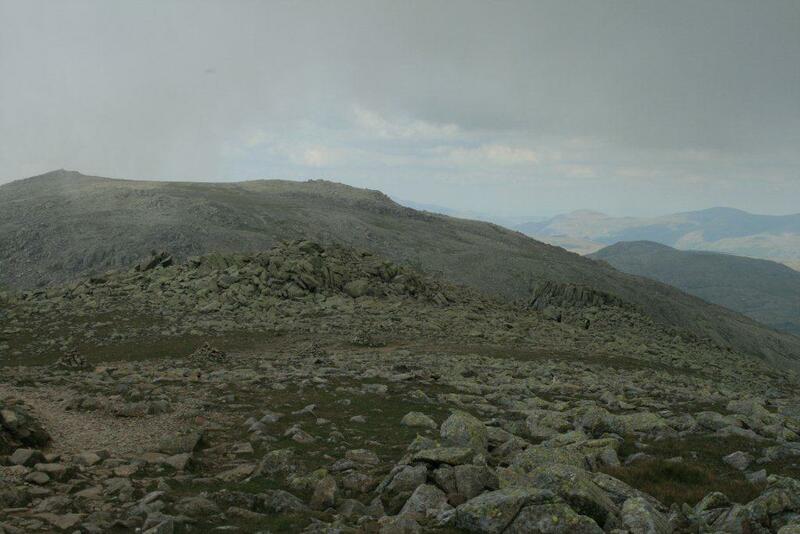 Personally, if at all possible, save this great walk for a clear dry day, for to go to all that effort to see only cloud or rain, I ask is it worth it? 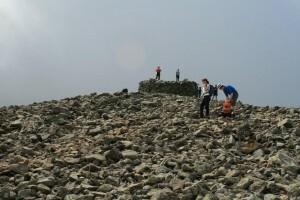 And most definitely give Scafell Pike a miss in bad weather. 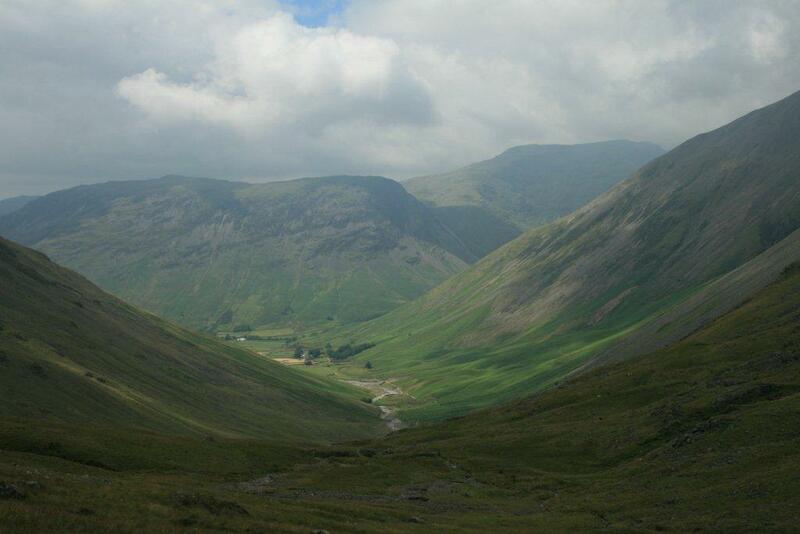 The above said one of my favourite Scafell Pike routes is from Seatoller in the beautiful Lakeland valley of Borrowdale. 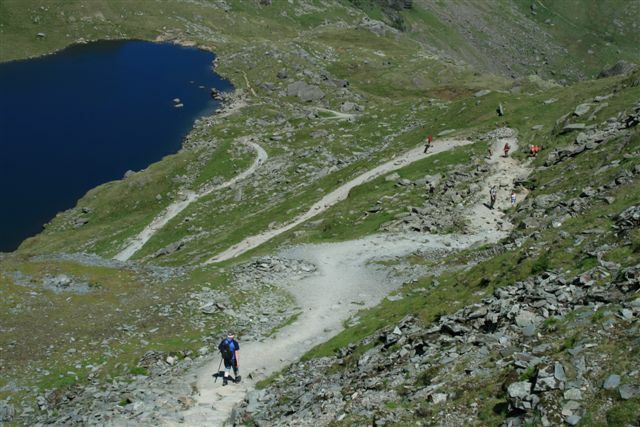 With the ascent of Scafell Pike from Borrowdale the walk presents no particular problems, although the route can be long for some walkers, who may therefore wish to start from Seathwaite instead of Seatoller, which will reduce the total distance to walk. 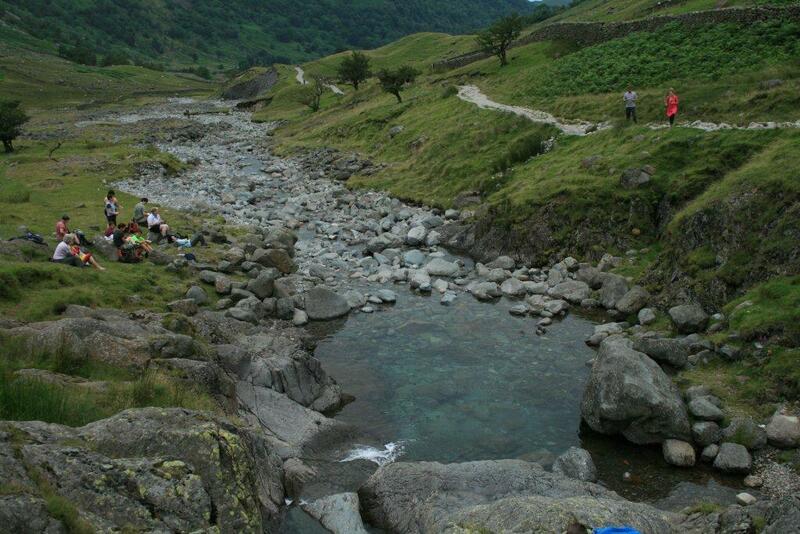 Seathwaite is a popular starting point for those attempting the 3 Peaks Challenge and Scafell Pike. 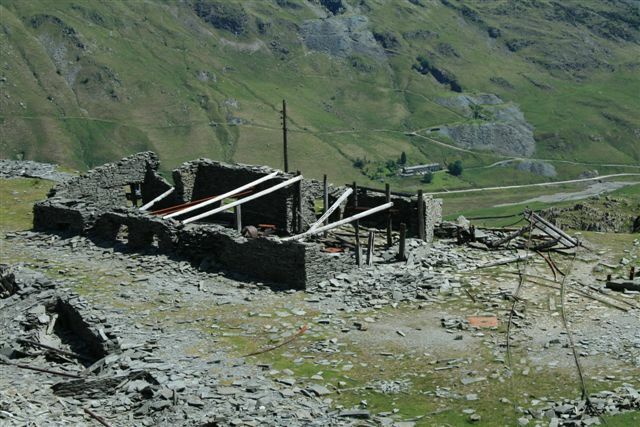 My preferred choice of ascent of Scafell Pike is to start at Seathwaite where there is currently ample free road side parking available. 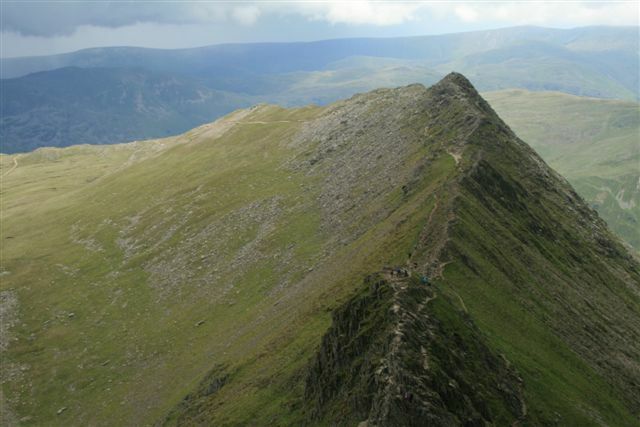 Once parked the grandeur and formidable size of the mountains impacts you and the knowledge of approximately 3,000 feet of ascent. 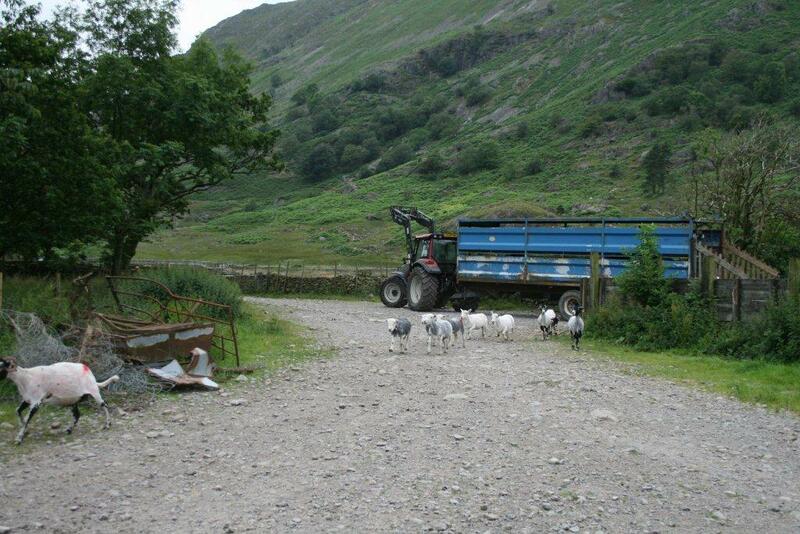 Setting forth upon the tarmac road head towards the farm at the end of the lane, which even since the days of Alfred Wainright and his ascent of Scafell Pike has not changed much and is still one of the friendliest farms you will find with friendly dogs and farm animals that are more used to visitors than most. 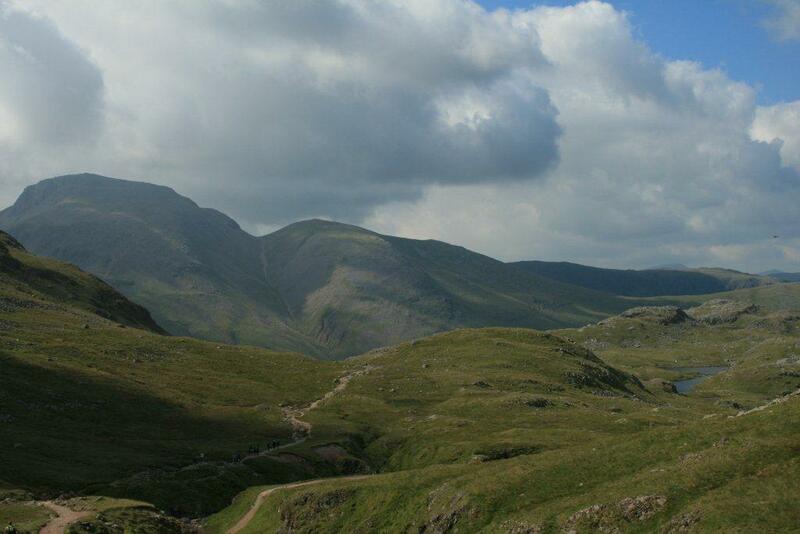 Once through the farm, for me, the real Scafell Pike walk begins. 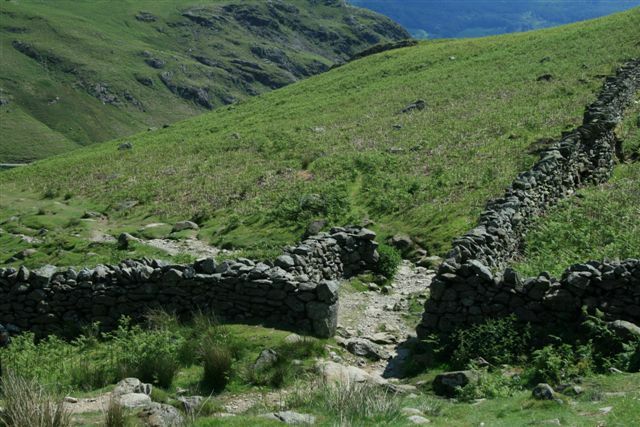 Keeping the river Derwent upon your right, ascend up the valley track whilst aiming for Stockley Bridge, which is a classic packhorse bridge, crossing over the waters of Grains Gill. 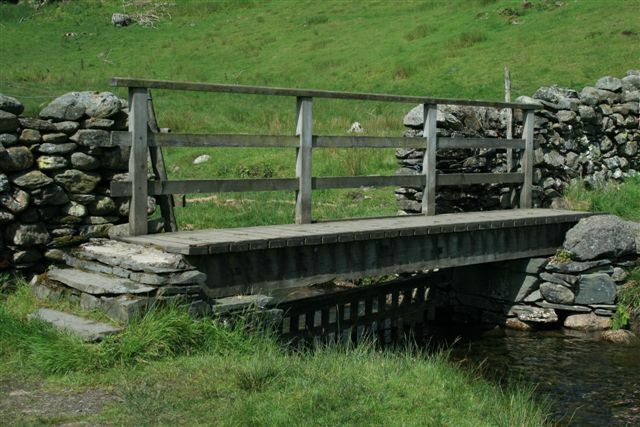 Crossing the bridge, it is our aim to skirt to the right of Seathwaite Fell, following Styhead Gill with a good quality path to be found here, heading towards the tarn. 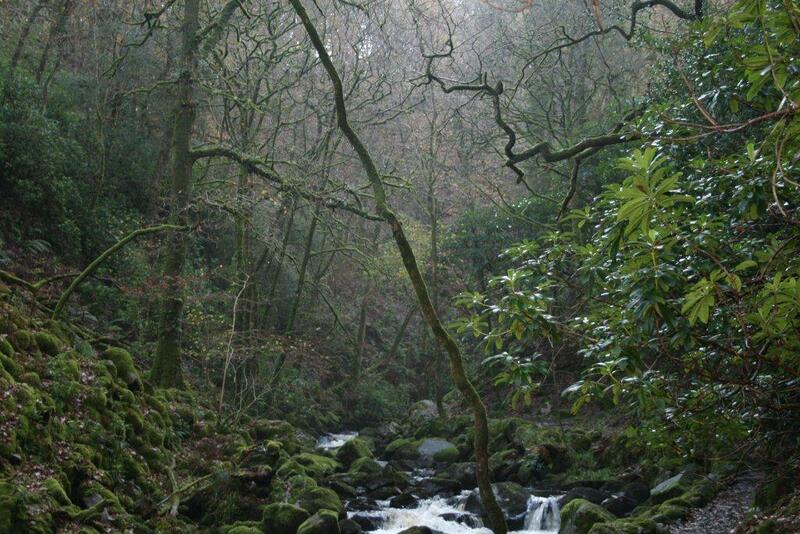 As you hike along the valley, cut by the gill. 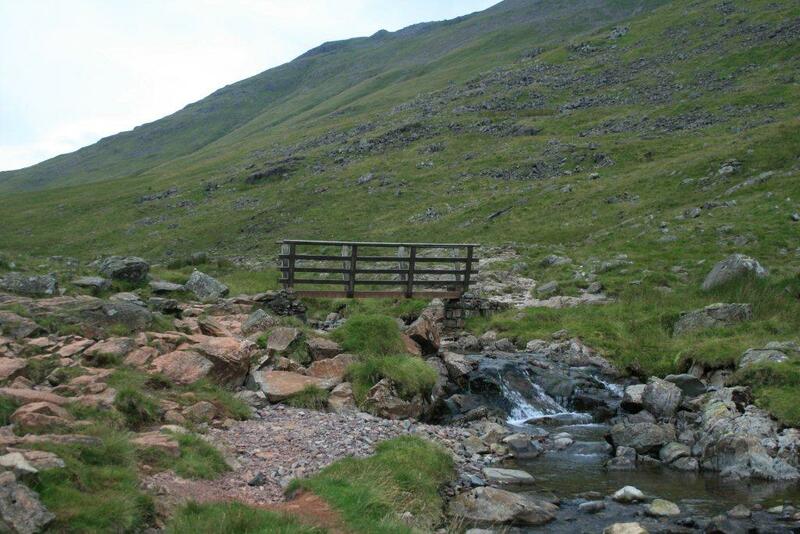 It is possible to cross the gill at numerous points, depending on the water volume and recent rainfall. 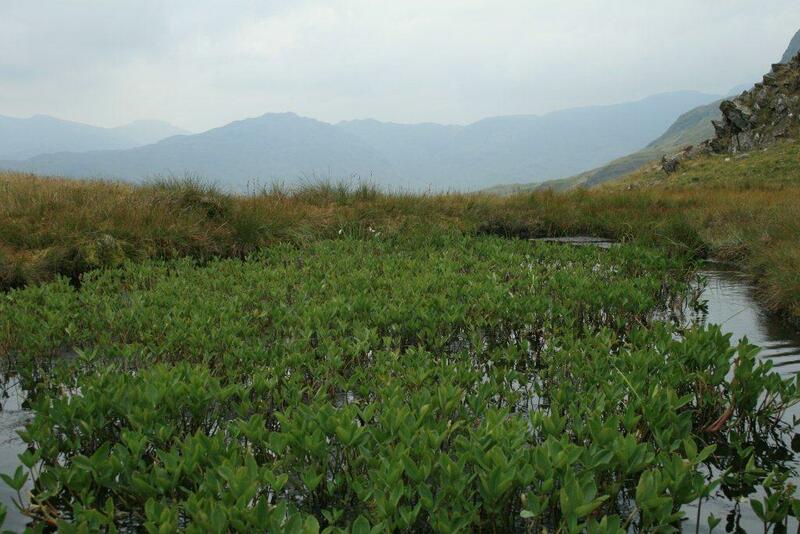 The foundations of an earlier bridge can still be seen with good quality new footbridge just as you approach Styhead Tarn. 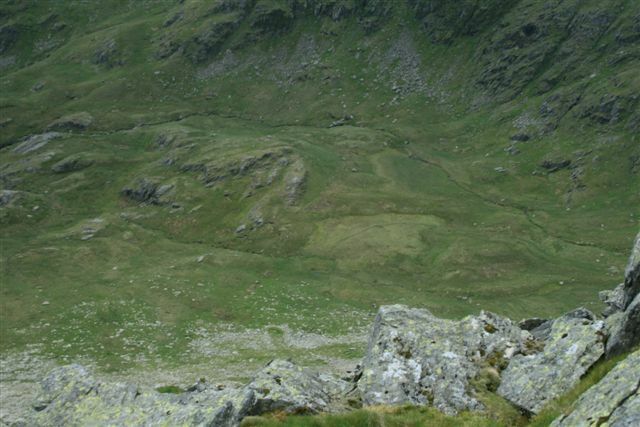 Having passed the tarn, now on your left, you will reach a main crossing of paths, which would and could lead you on to such fells as Great Gable and Wasdale Head. 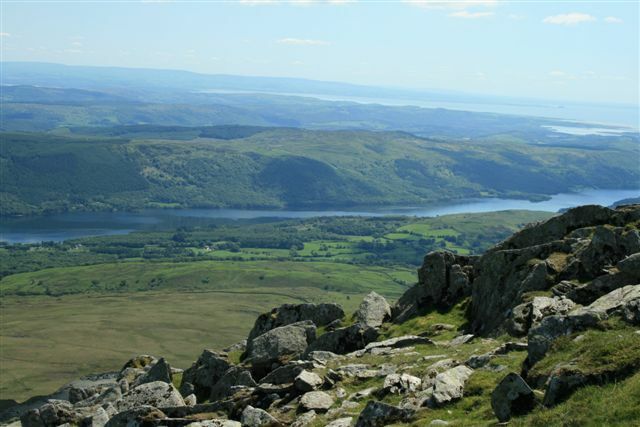 Here, a short stop is strongly recommended, as you take in the views and stunning magnificence of the fell., The tranquillity and peace is undeniable. 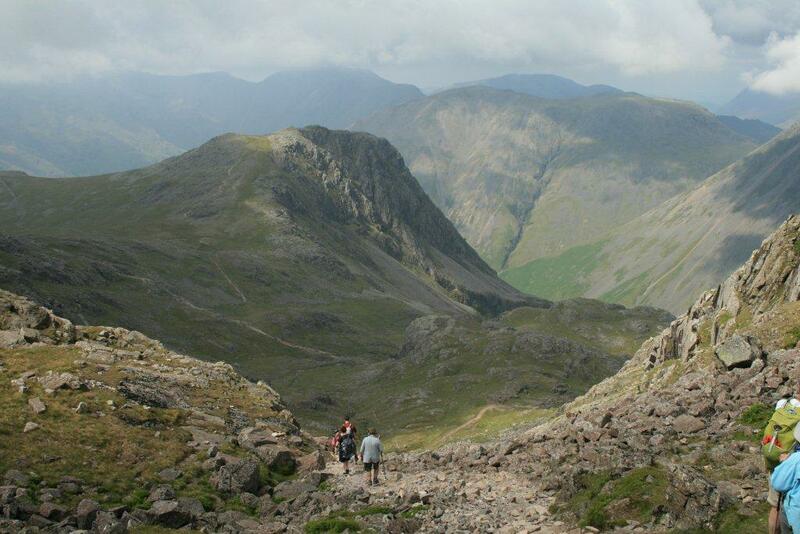 At this point in my walk, I met up with a great group of Liverpool taxi drivers, who were out for the day walking to the top of Scafell Pike via a different route, and with the inevitable chat about football (Liverpool, Manchester United and my Manchester City). 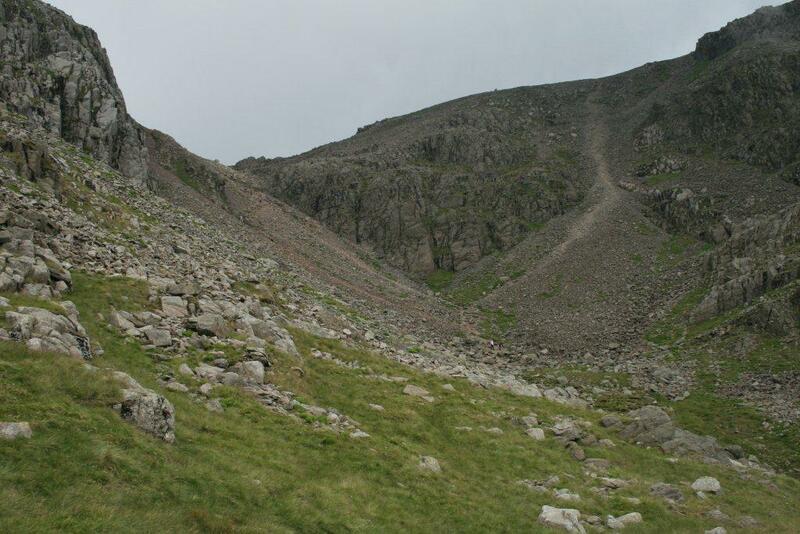 A good marker point for this junction of paths on the ascent of Scafell Pike is the Stretcher box. 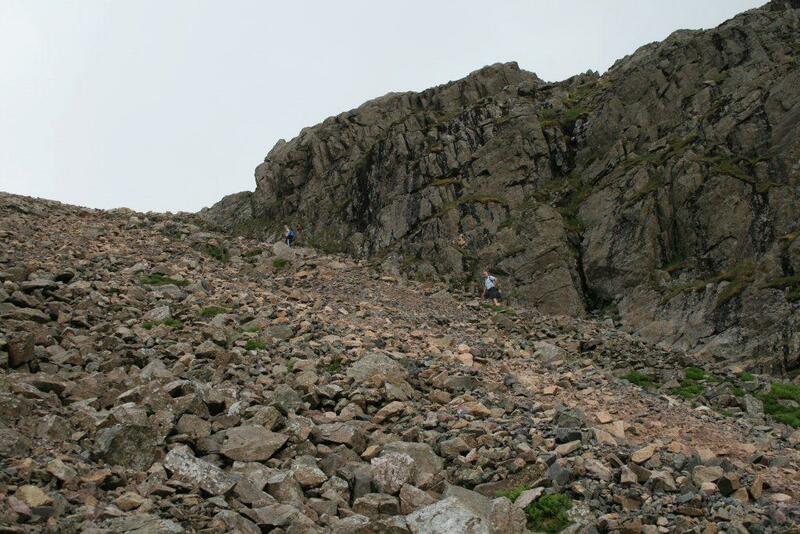 Here we also went our separate ways to ascend Scafell Pike with the Liverpool lads taking the route past Sprinkling Tarn and us taking the Corridor route to the summit. 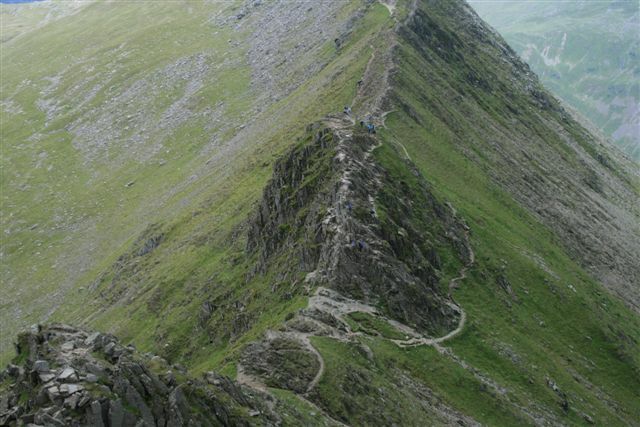 There are 2 Corridor routes and confusion comes quickly here with the lower path being the one to avoid and keep to the higher ground where the path slants upwards and across. 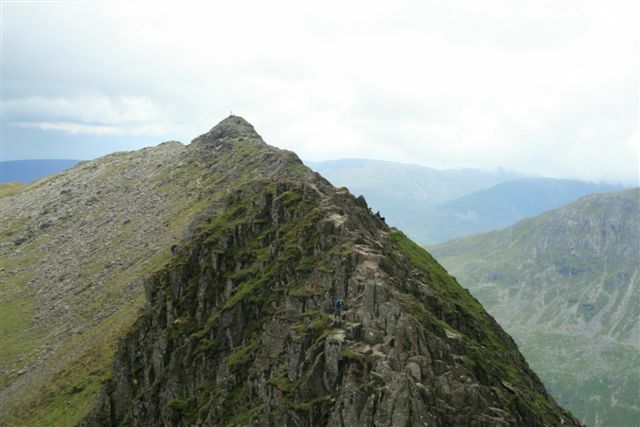 My particular advise here is simply a personal preference that I would rather be looking downwards for a path I have lost, with some form of aerial height advantage in this than trying to look upwards for a path I cannot find. 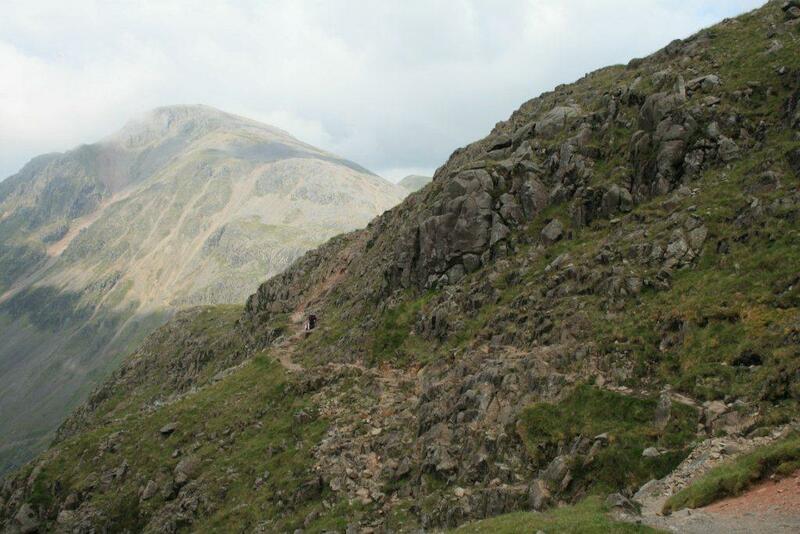 Thus following the high level corridor path which once you have found is relatively straightforward to follow being the only easy route possible, and it’s onwards and upwards towards Scafell Pike. 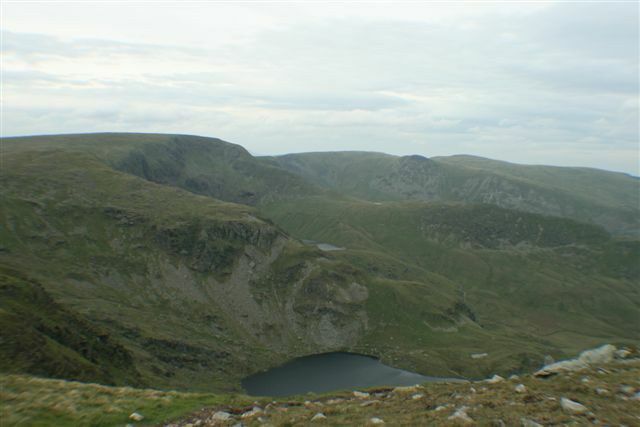 The Corridor route follows the path along the western slopes of Great End, Round How and lastly Broad Crag upon your left. 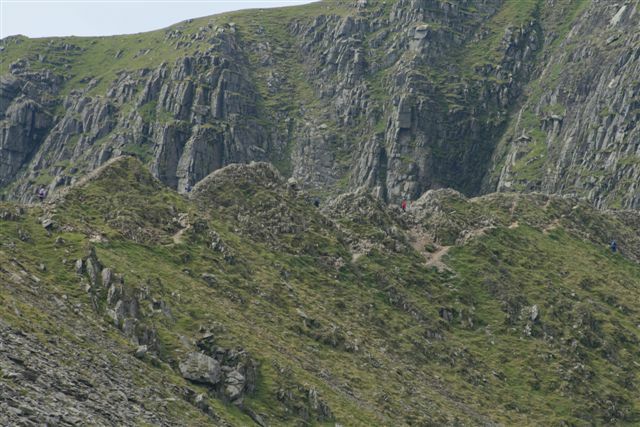 As you approach the foot of Broad Crag, it is possible to ascend or descend Scarfell Pike via Broad Crag Col, which in my opinion is well worth trying, whilst covered in boulders, stones and loose scree, awkward under foot in the best of conditions and tricky to navigate over in bad visibility with crags or steep rough ground on all sides. 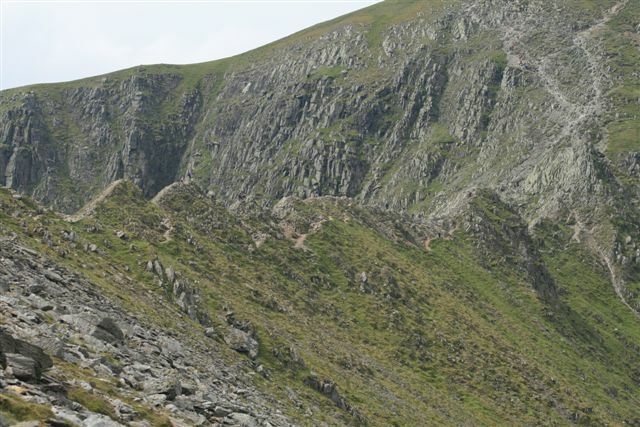 My tip here would be to keep to the right whilst ascending as the large rocks invariably collect here and there is less chance of slipping on the loose scree. 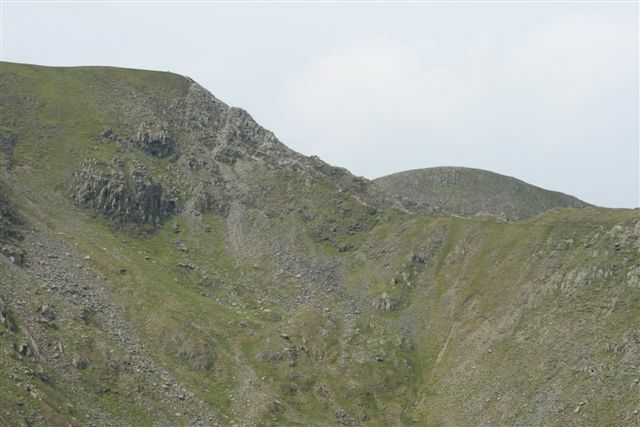 This was our choice on the day, Broad Crag Col for our ascent to Scarfell Pike as it is these factors that lend a degree of seriousness to the ascent, making it so much more satisfying a mountain day to remember. 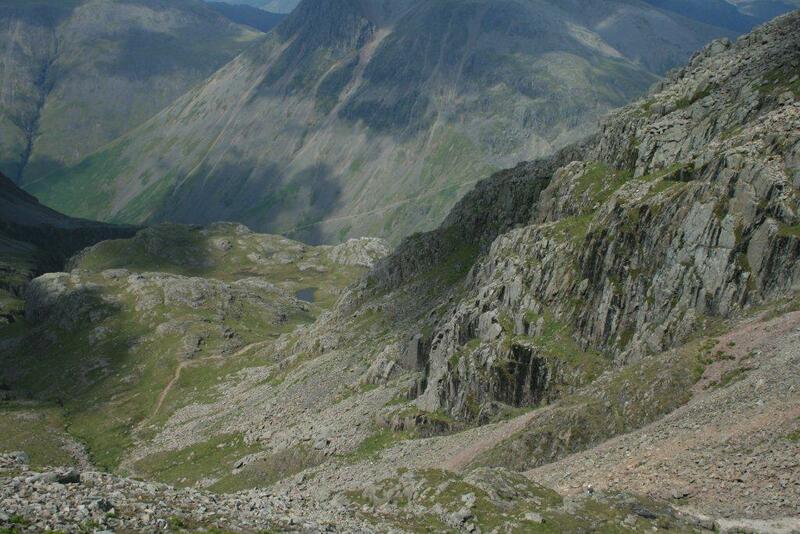 This for me is rugged mountain country at its best. 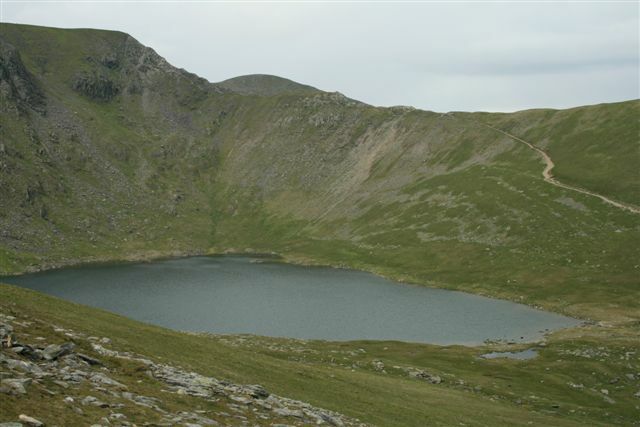 In snow and ice this ascent can be hazardous and ice axe and crampons are advisable. 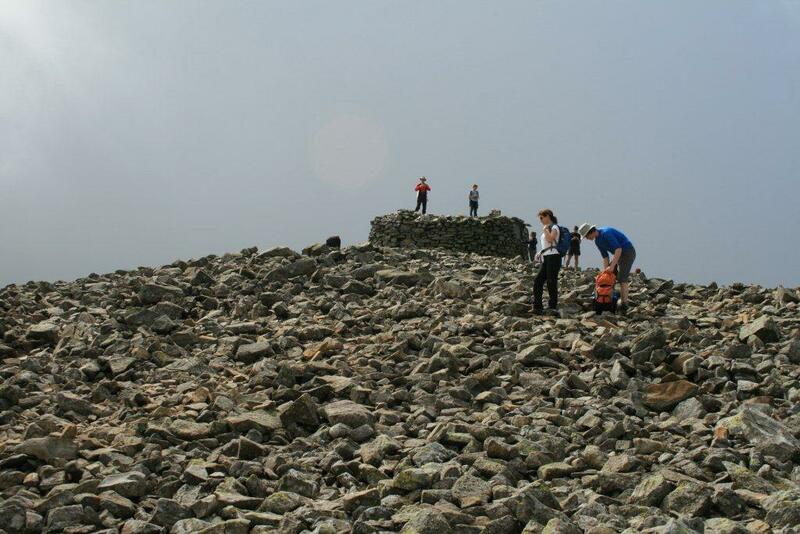 When you reach the top of Broad Crag Col, the reward is a view of your final destination and the summit of Scafell Pike, and with one last push it is up the rock and pathway to the top. 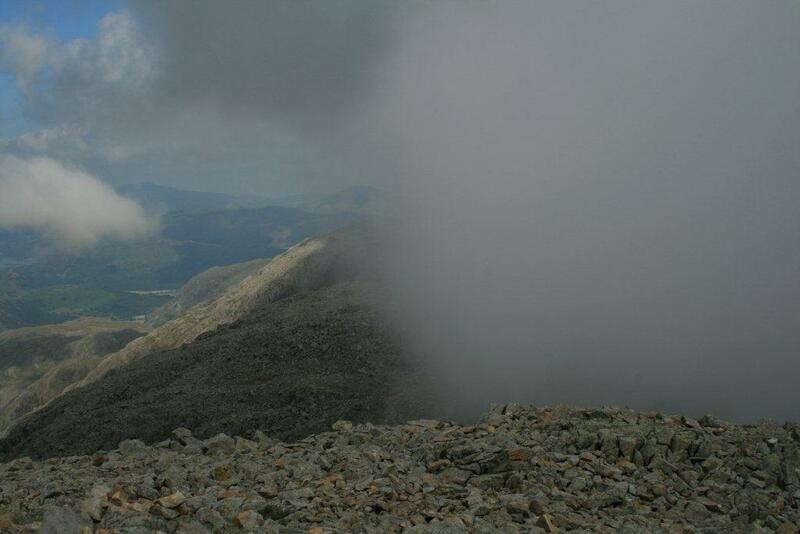 With a clear day the views are stunning, whilst even on a good, day cloud can come rolling in and therefore it’s best to be prepared. 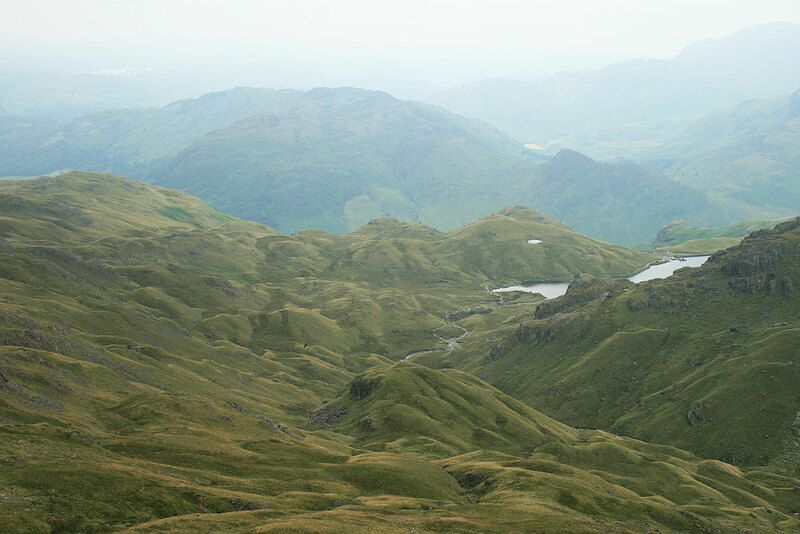 Should you take the time to look at my full collection of pictures for this walk on my Lake District Walks Flickr account, you will see how the weather changes from some pictures to pictures. 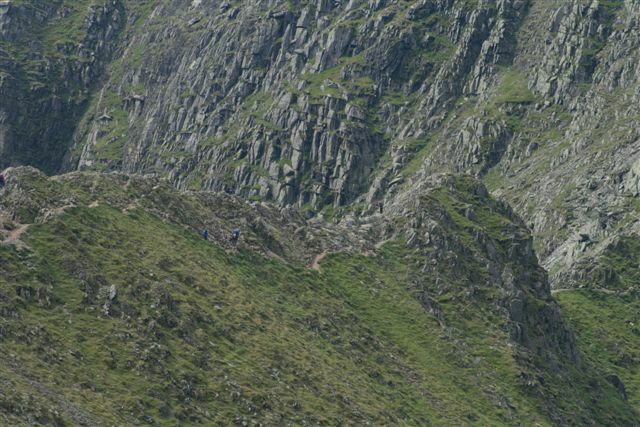 Following our lunch at the summit we continued to return back to Seathwaite in an anticlockwise direction around Broad Crag and Great End. 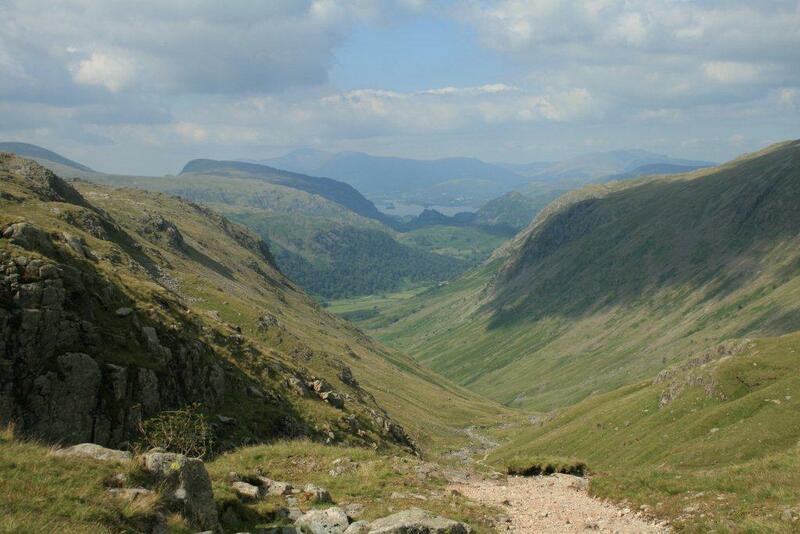 The path down from Great End is good and clearly marked with views towards Derwent Water and beyond. 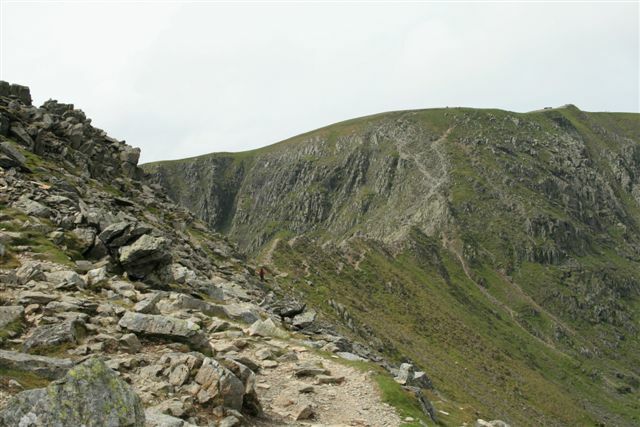 As you approach Esk Hause you take the left hand path towards Allen Crags and on a good day you will see the path before you. 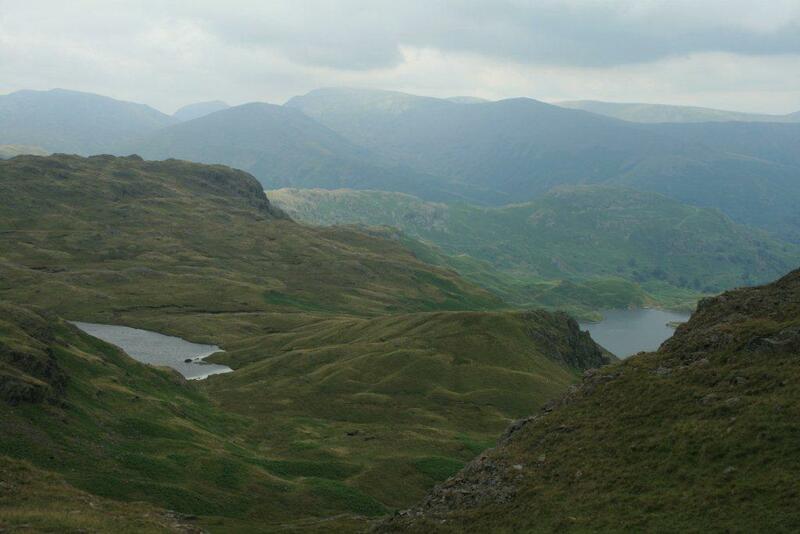 Take the next turn to the left, heading back in the direction of Sprinkling Tarn. 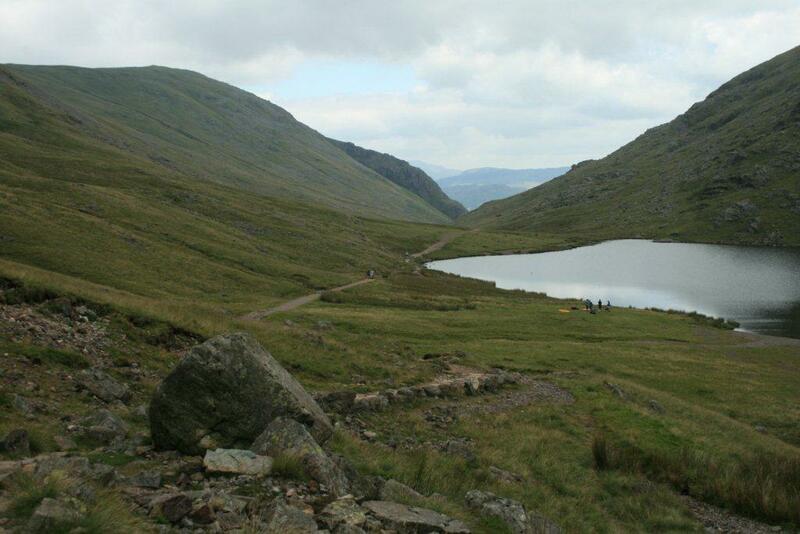 As the Tarn comes into view, you will also be looking for a footpath on your right which is very well maintained. 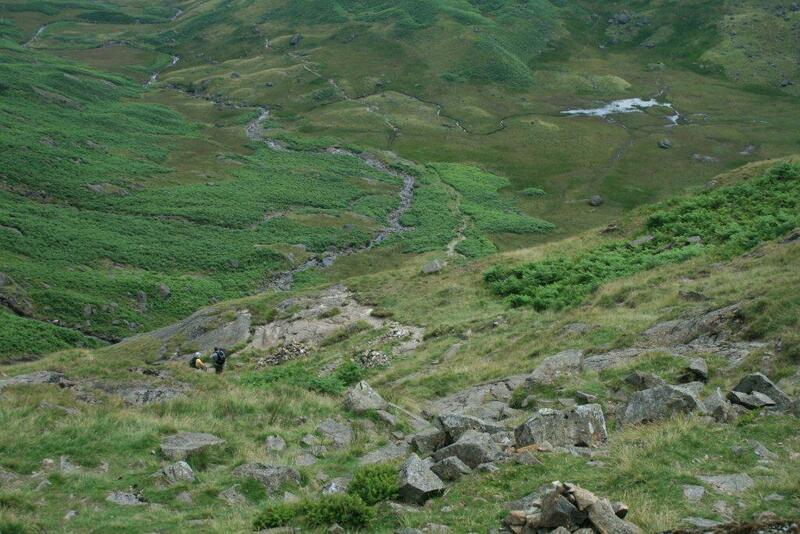 Follow Grains Gill as it cuts an impressive route through the rock, making its way down towards the River Derwent. 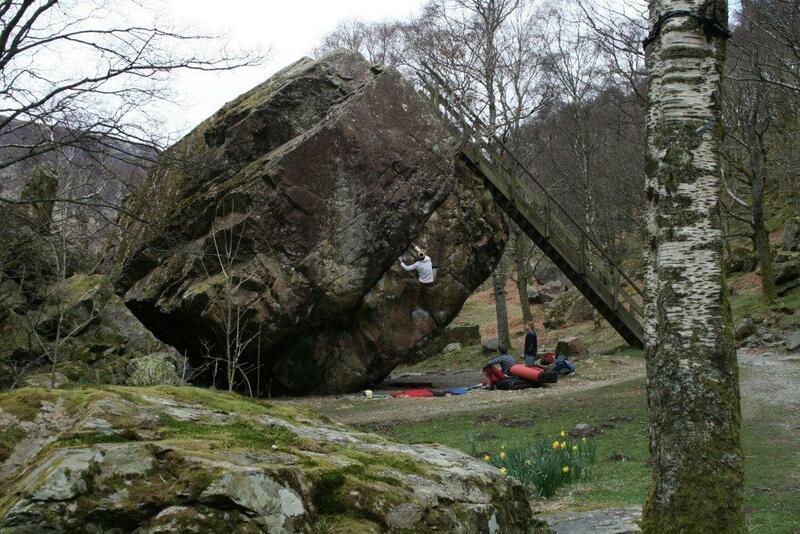 As you progress downwards with a quick reduction in altitude, following a great day out, simply make your way back to Stockly Bridge. 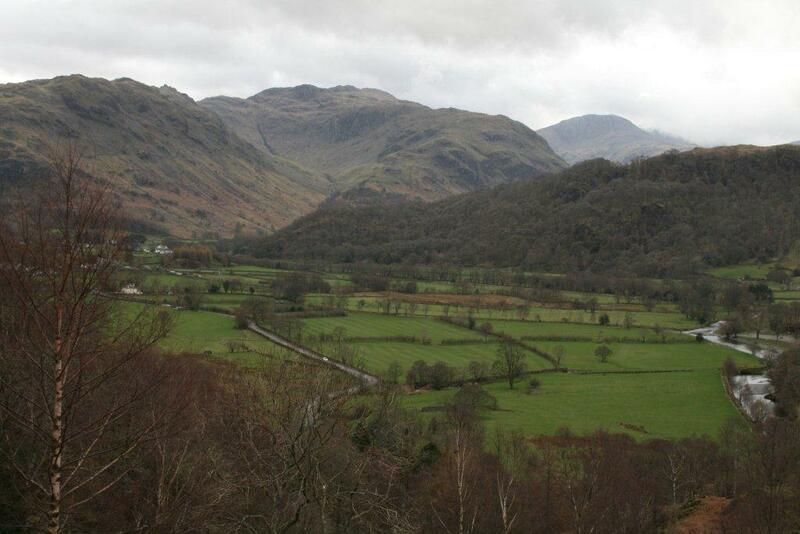 Thus completes this near circular walk, and with a final few steps towards Seathwaite, your well-deserved transportation home. 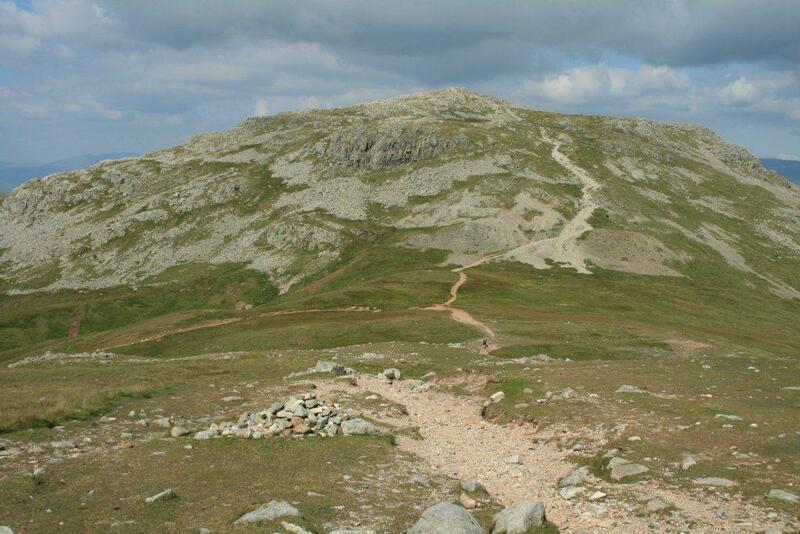 Should you wish to see better quality photographs of Scafell Pike walk please visit Scafell Pike Walk on our Lake District Walks Flickr account. 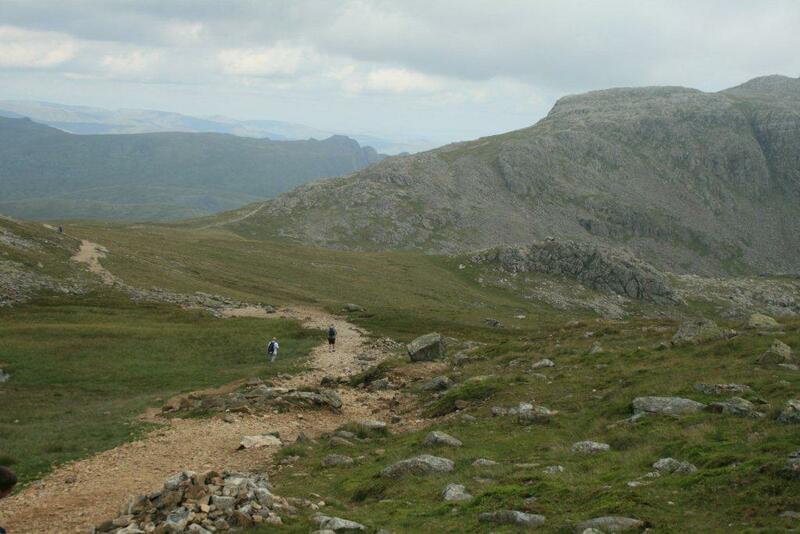 Scafell Pike is a great days walk and I hope you enjoy your walk as much as I did my walk. 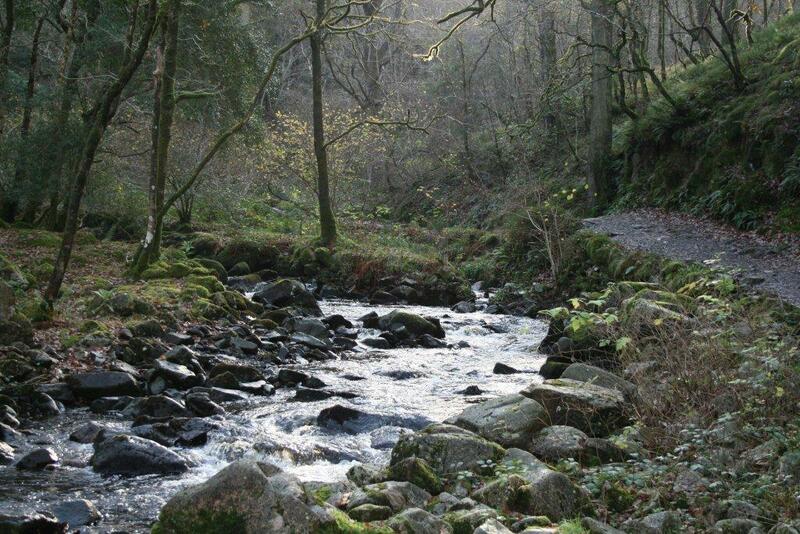 Within the Lake District there are walks and there are super special walks. 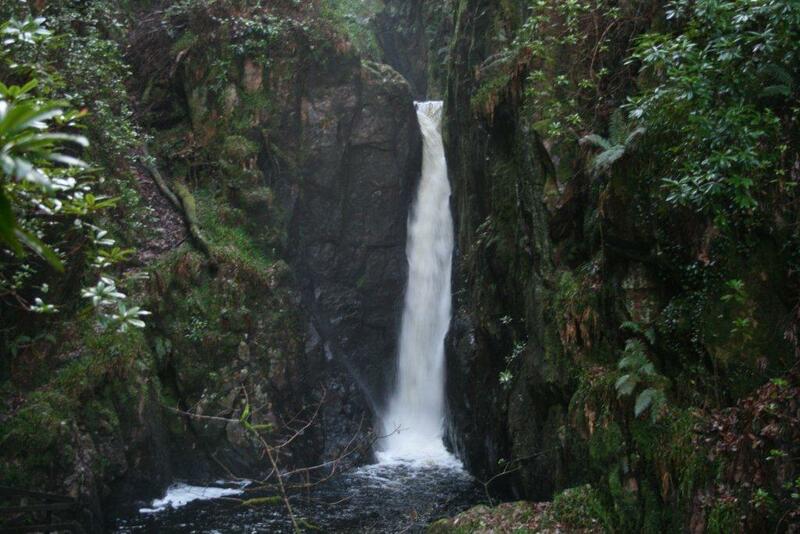 In my opinion Stanley Ghyll Force waterfall belongs in the category of super special. The reasoning behind this is quite simple as I thoroughly enjoy the mode of transport in getting there and back. 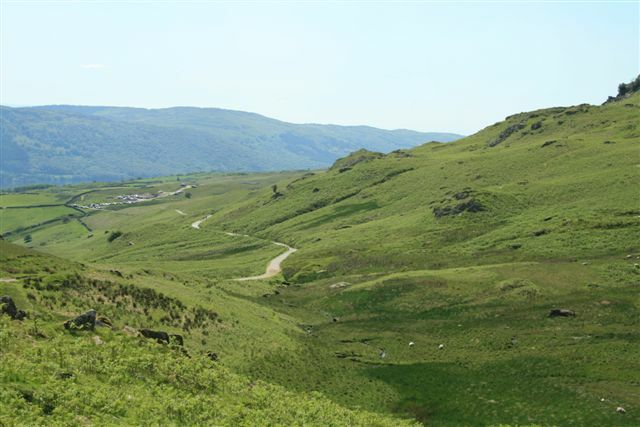 It is not a requirement to start my Stanley Ghyll walk at Ravenglass Steam Railways but it does add that great bit of panache in arriving at Dalegarth station, which is the actual starting point. The 7 mile and 40 minute journey on a thumping polished steam engine takes some beating with the smell of burning coal in the air. 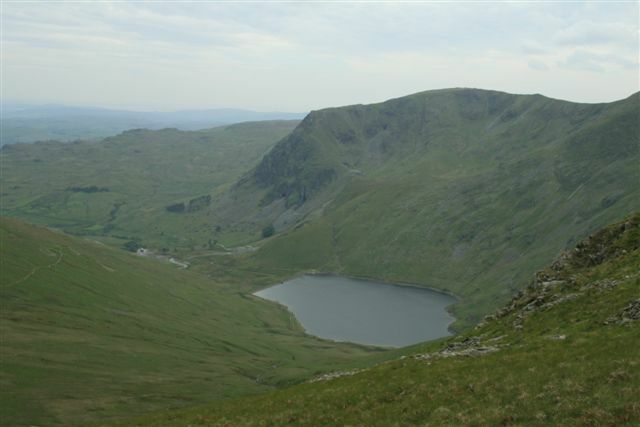 The train takes the strain as I arrive at Dalegarth in a relaxed state ready to embark with rucksack, map and lunch. 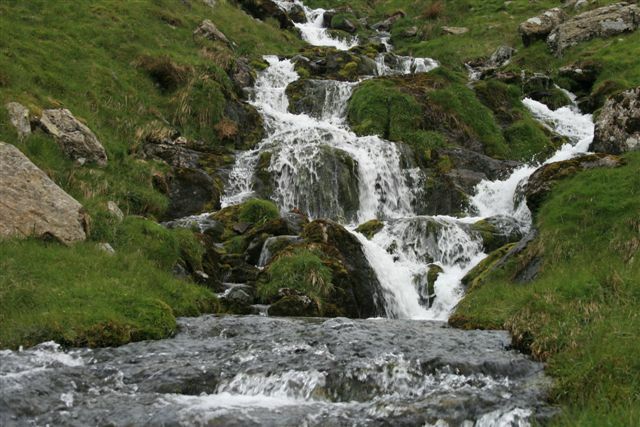 Stanley Ghyll waterfall is the most popular walk from Dalegarth station and is approximately a one mile walk. 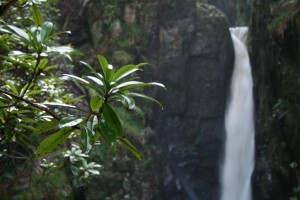 Surrounded by a stunning backdrop of trees, it is in my opinion one of Lakeland’s most beautiful waterfalls. Upon leaving the station, take a right turn along the road and you will pass the local coach yard. 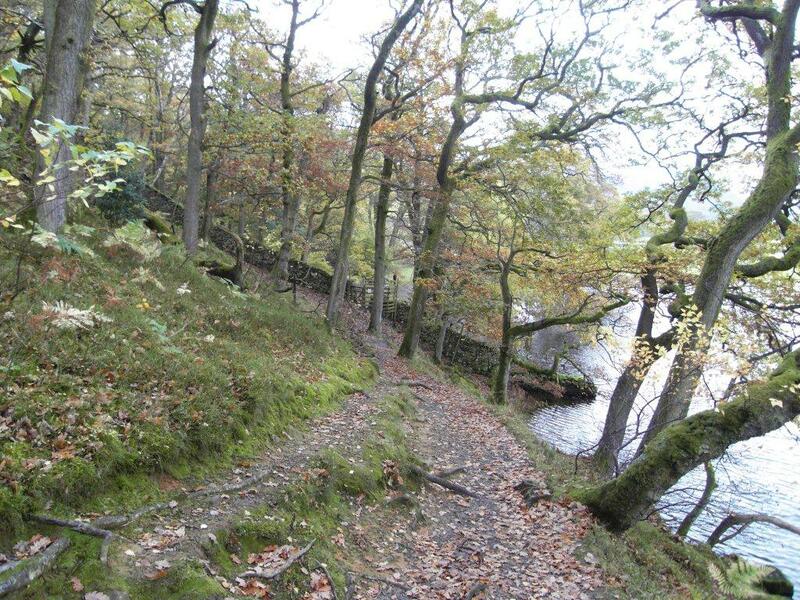 Continue forward for a short distance before turning left onto a narrow signposted lane, which will take you across the River Esk. 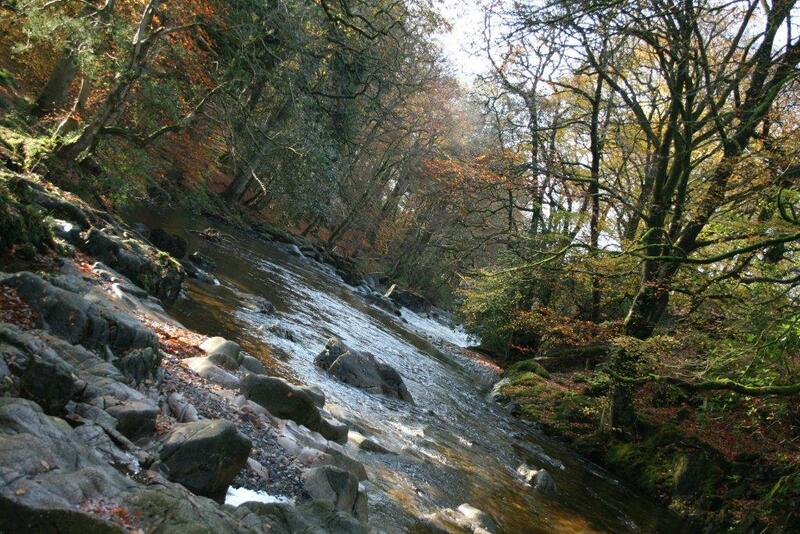 This is a beautiful spot and judging by the rope swing hanging from the tree, this has been enjoyed by many a young person playing in the river on a summer’s day. 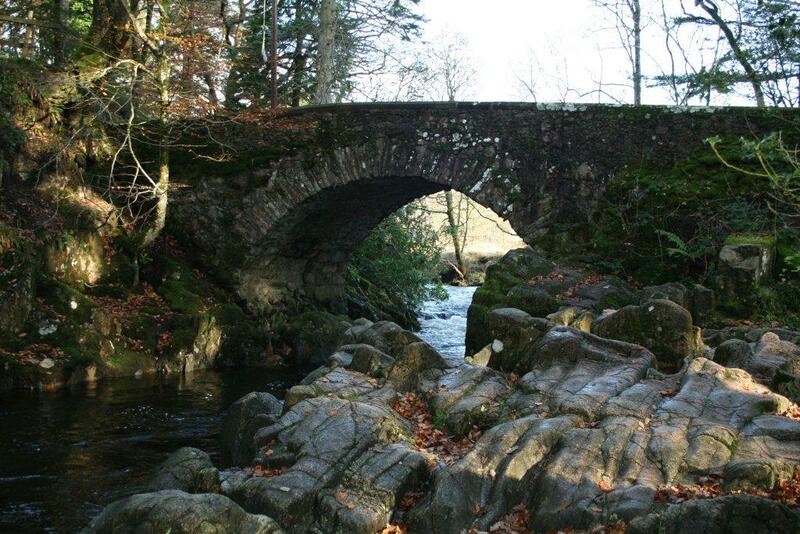 Within a 100 yards of the River Esk bridge, there is a car park for use, should you arrive here by car. 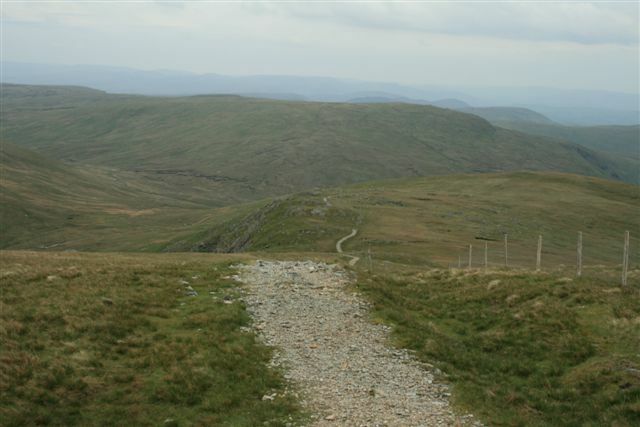 Pressing forward, you will come upon a road junction with Dalegarth Hall in view. 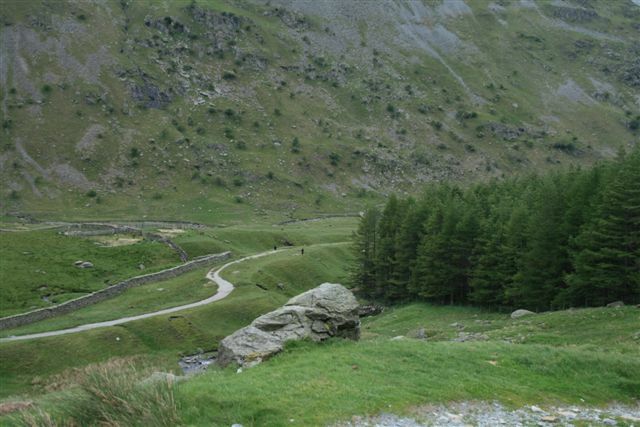 Taking the left lane, we continue upwards at a gentle easy amble, until we arrive at a gate on our left with a sign post and access to Stanley Ghyll wood. 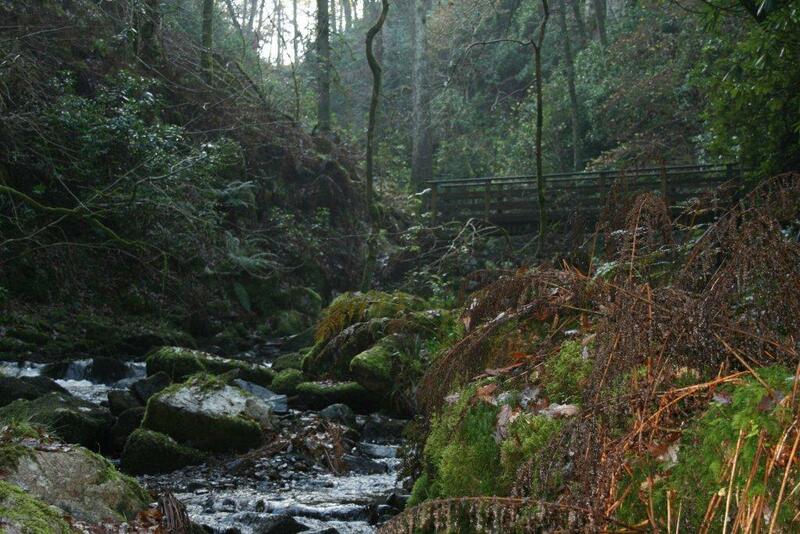 From the gate, the path starts wide and easy to follow as it makes its way to the stream’s water’s edge as it continues upwards through the woodland ravine. 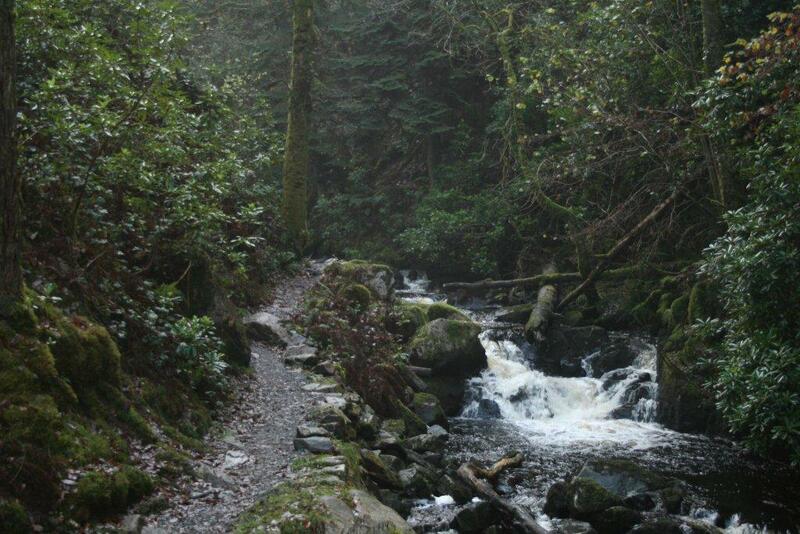 The path here can be wet and slippery in places and good walking boots are recommended. 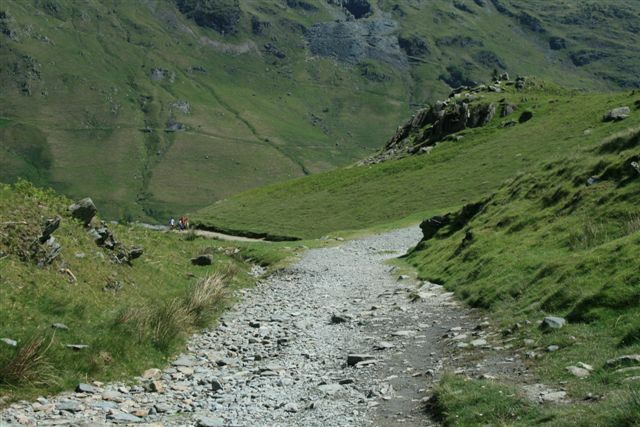 The path continues to wind its way upwards following the stream with a total of three bridges on route to Stanley Ghyll waterfall, with the ravine narrowing dramatically after the third and final bridge. 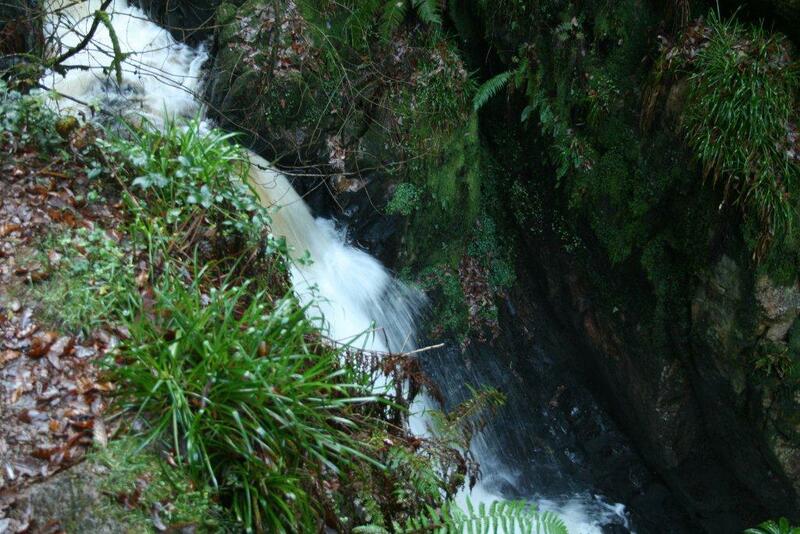 With a scramble up the left hand bank of the stream, you will arrive at the sumptuous waterfall. 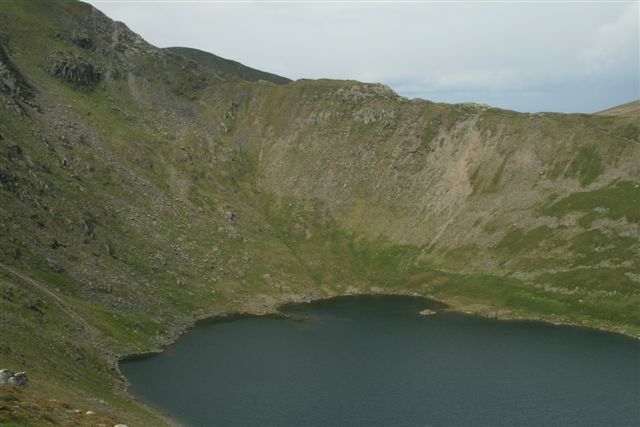 Should you have small children keep them close as the water can be deep and cold here. 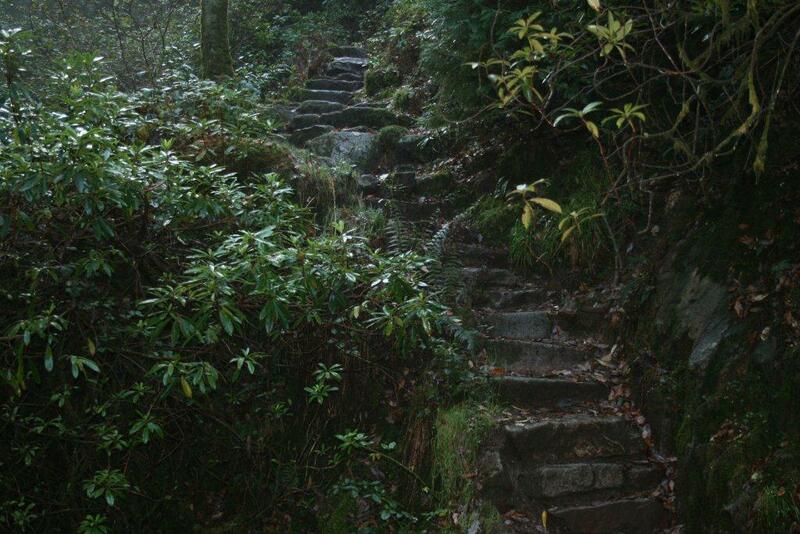 From this point a return to car or train is easy by the same route, although for us we had decided to go upwards and around the high ground of Stanley Ghyll waterfall. 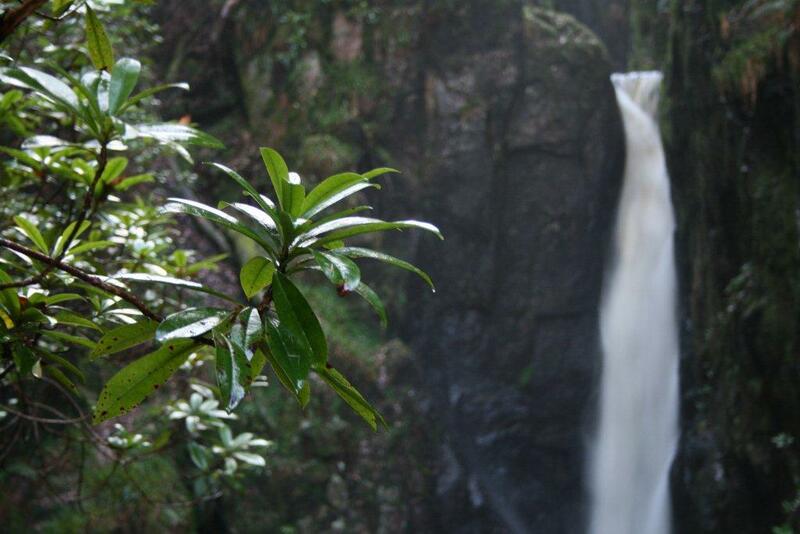 You do wonder where all the water comes from and the catchment area of such spectacular waterfalls. 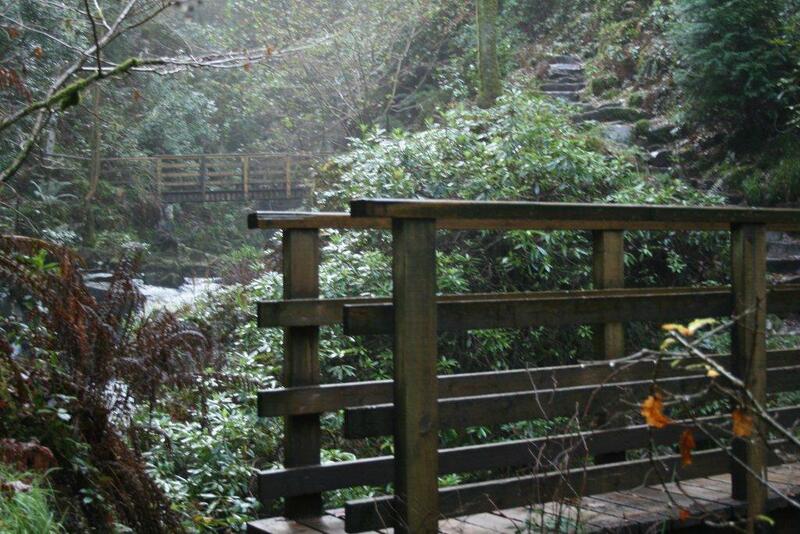 Returning from the water fall and crossing the first high level bridge you will notice a path going off to your left with what looks like a steep climb. 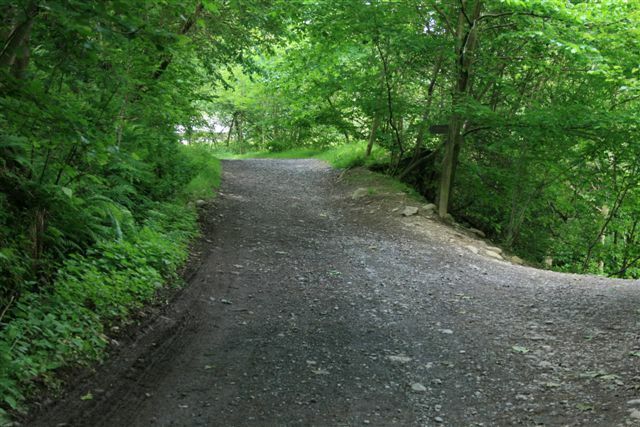 Taking this path it only rises some 40 feet or so before opening into a small woodland glade with no path to be seen and what looks like a dead end. 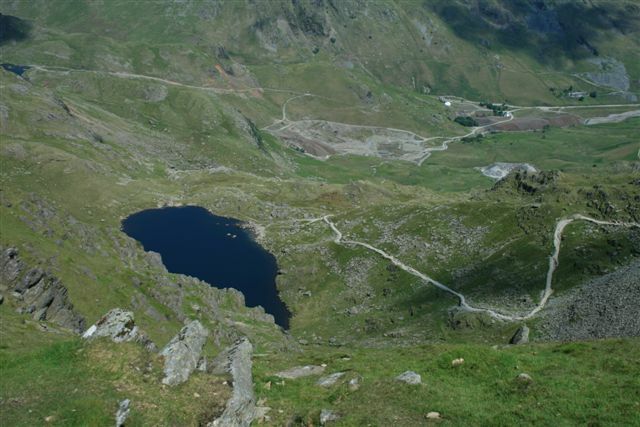 The path is to your left upon the steep bank and will take you upwards to a spectacular vantage point near the top of Stanley Gyhll waterfall and this will help you to navigate to this spot. Reaching the summit of the 150 feet ravine and awesome aerial views of Stanley Ghyll waterfall looking downwards from the cliff edge, is very rewarding and a great spot for lunch. 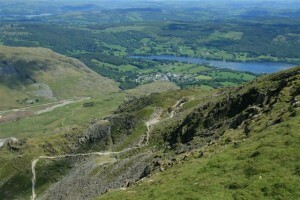 It is worth a mention to all here to be careful near the edge as it is a long way down and there is no lift back up !!!! 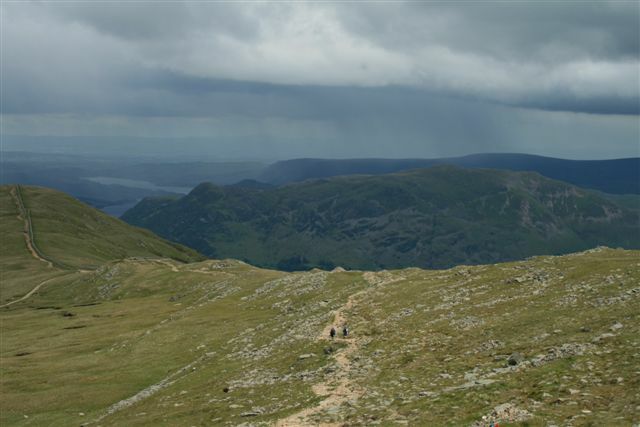 Leaving our lunch spot at the top of Stanley Ghyll, follow the less well trodden path out onto the fields over the stile and turn left. 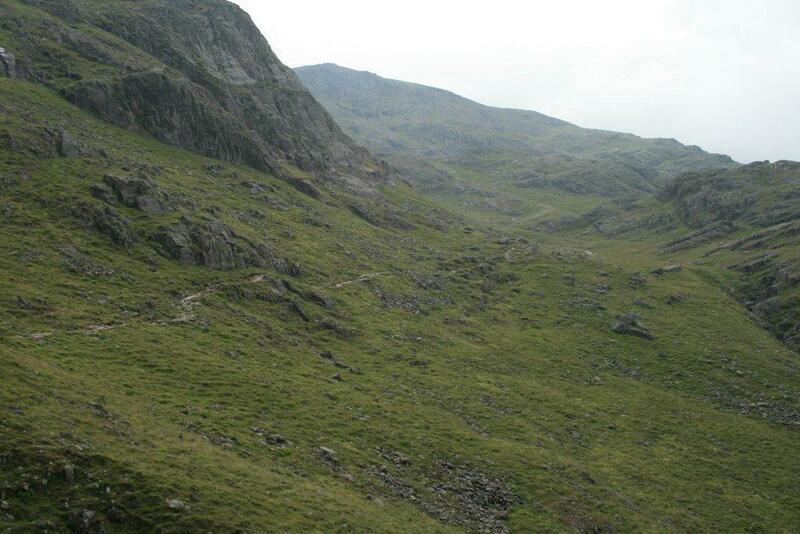 The footpath here is very poor and hard to follow. 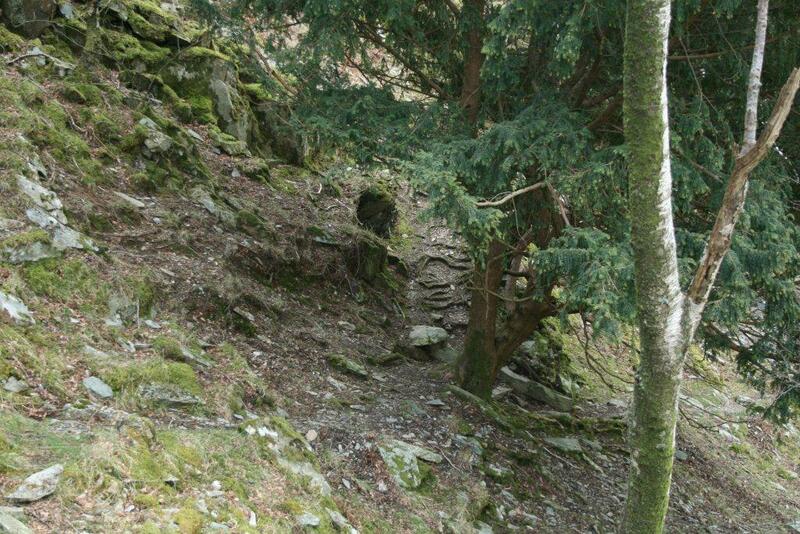 We simply followed the dry stone wall by keeping it to our left until we reached the open path leading to the farmhouse. 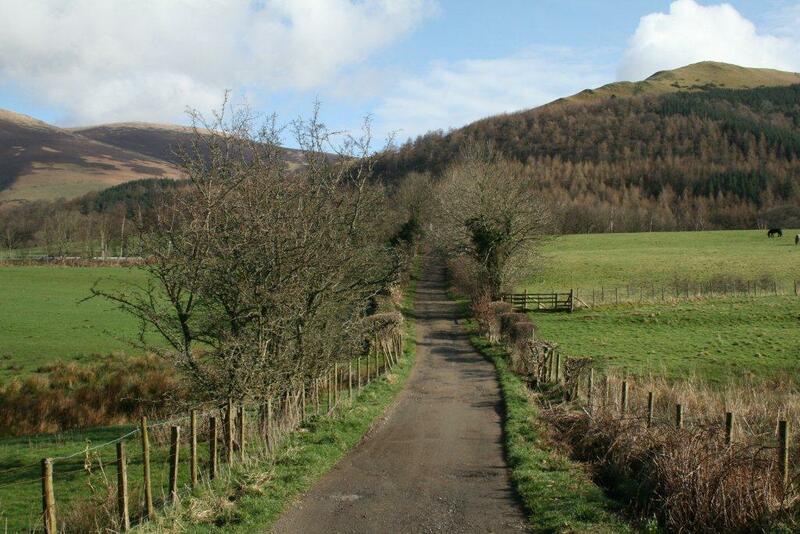 The path continues through the farmyard and you will clearly see another farm located to your left and a track leading there. 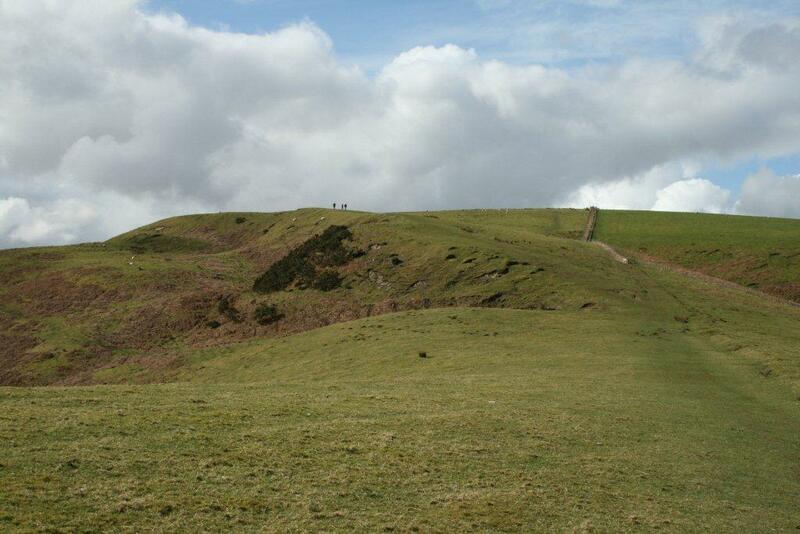 Following the track and passing through your second farm, the footpath leaves via the left side of the main farmhouse. 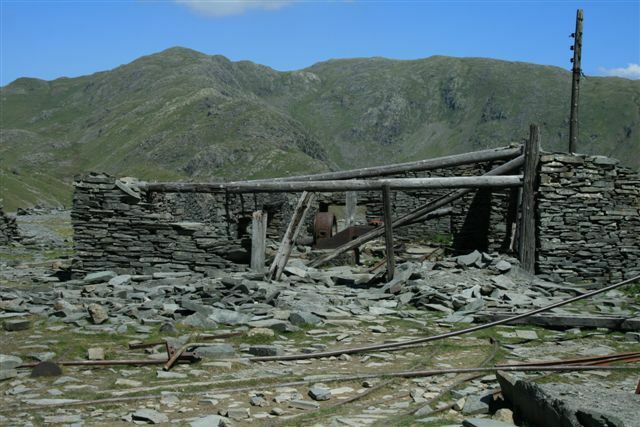 Remembering to shut all gates and leave things as you found them, following the country code. 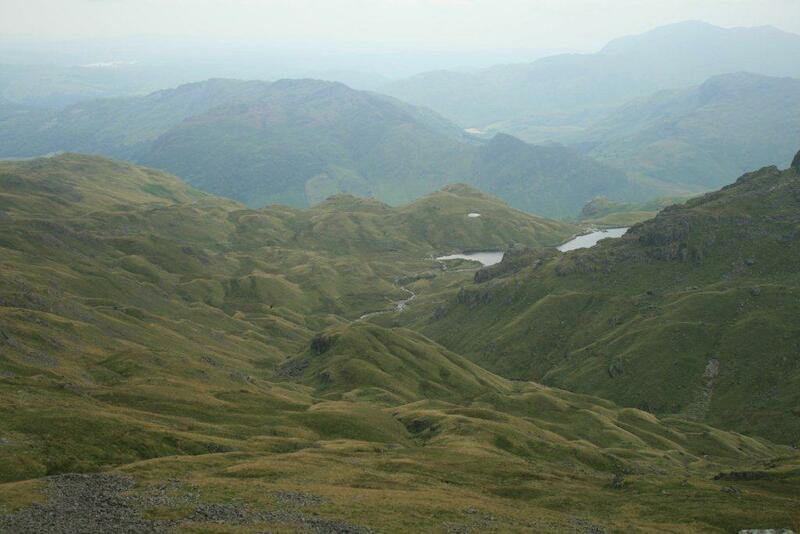 With the vantage point now high above Stanley Ghyll and Dalegarth your way back will now be more clearly visible. 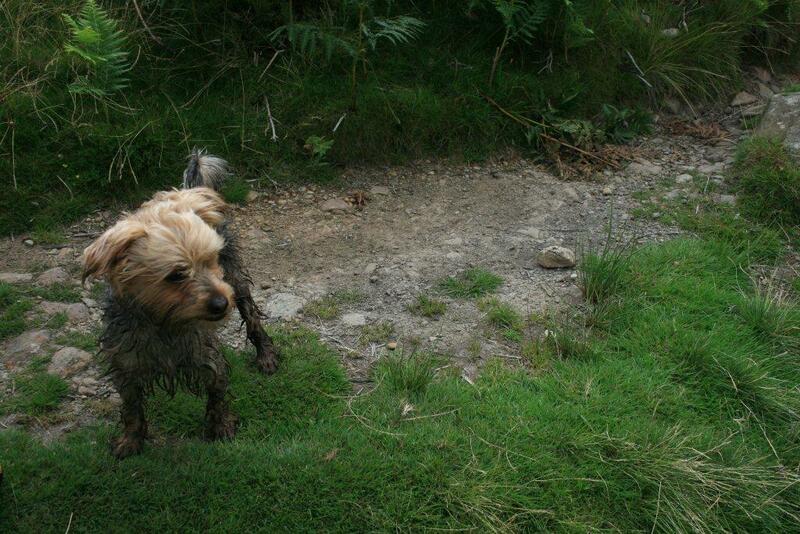 We found the ground to be very wet under foot. 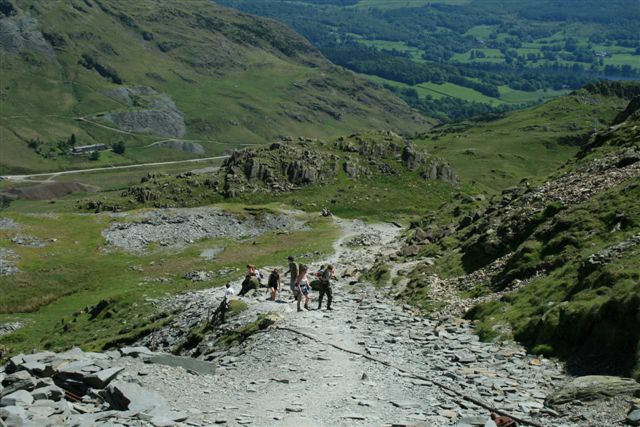 The footpath here is not the clearest, yet hiking this route I believe is more enjoyable than simply walking to Stanley Ghyll waterfall and back. 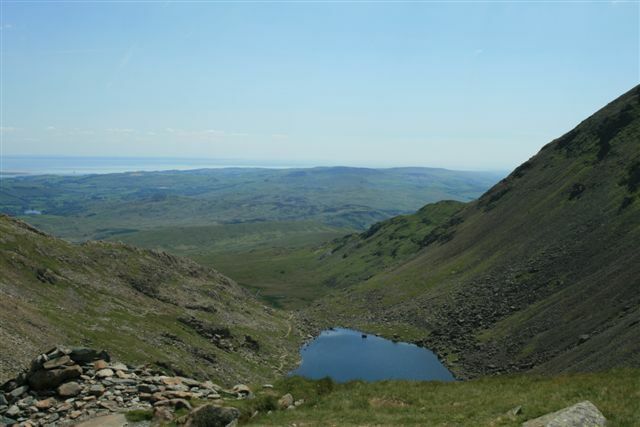 With the added altitude you are rewarded with some outstanding views of Eskdale valley towards the wild Scarfell mountain range. 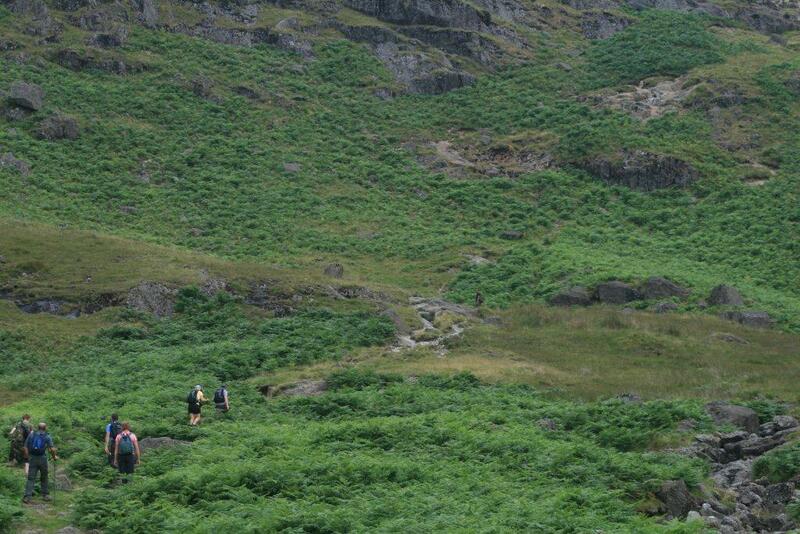 It is at this point I will say that walking with my friend we lost our map. 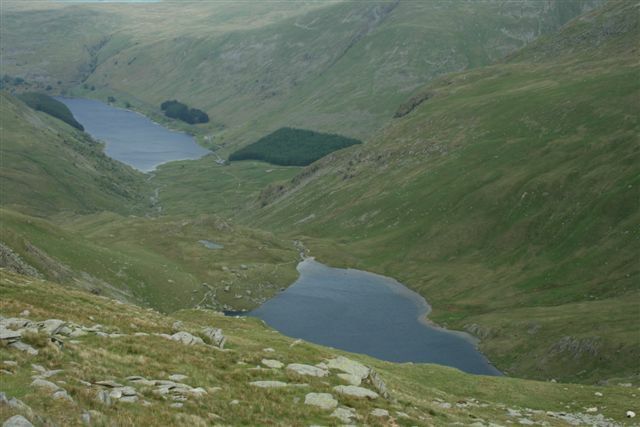 I like to photocopy my map and simply bring an A4 paper copy out walking as this saves my map from excessive use. 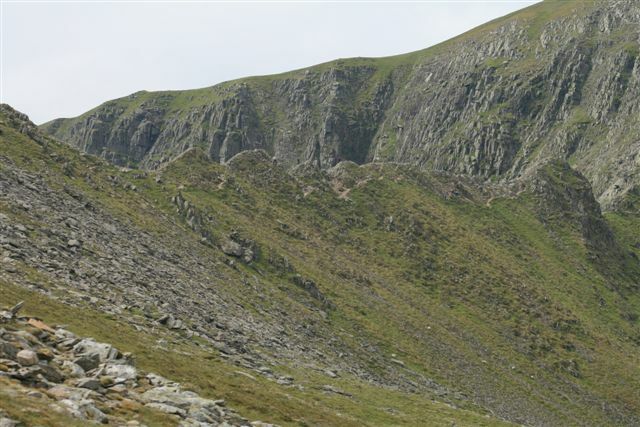 I had my handheld GPS Garmin with me which took us the way home and is a great bit of kit for bad weather or when footpaths are poorly marked. 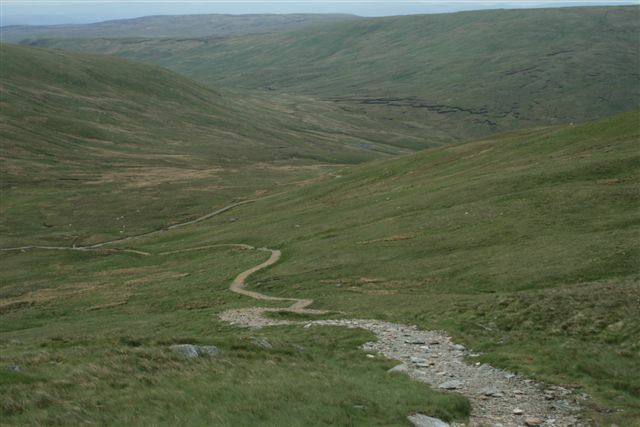 With your Ordnance Survey map you should easily find your way back to the river and basically the Stanley Ghyll waterfall walk contours around the ravine and return back to Dalegarth Hall. 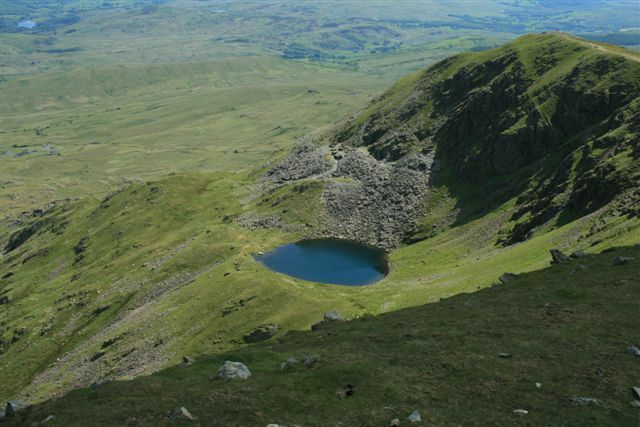 While planning this Stanley Ghyll walk in conjunction with the steam railways it is worth checking on train timetables as we returned to Dalegarth Station with 20 minutes to spare and time for a coffee. 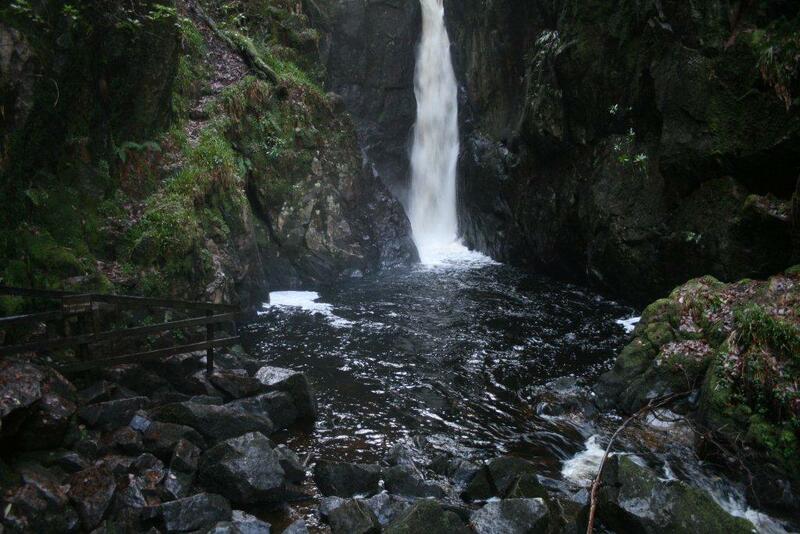 Should you wish to see better quality photographs of this Stanley Ghyll Waterfall walk please visit Stanley Ghyll Waterfall Walk on our Lake District Walks Flickr account. 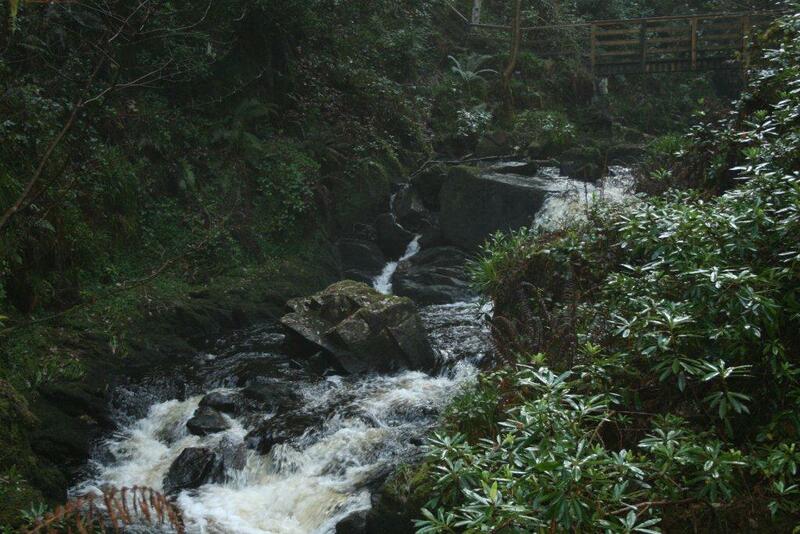 Wear study footwear and enjoy Stanley Ghyll Force waterfall walk. 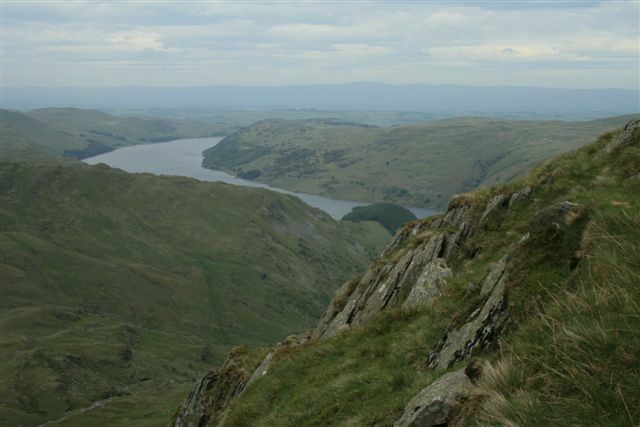 It is easy to walk up and down dale so to speak here in the Lake District, although should you be looking for a stunningly beautiful low level lake walk, along the shores of arguably one of England’s finest lakes here is the Ullswater lake walk sfor you. 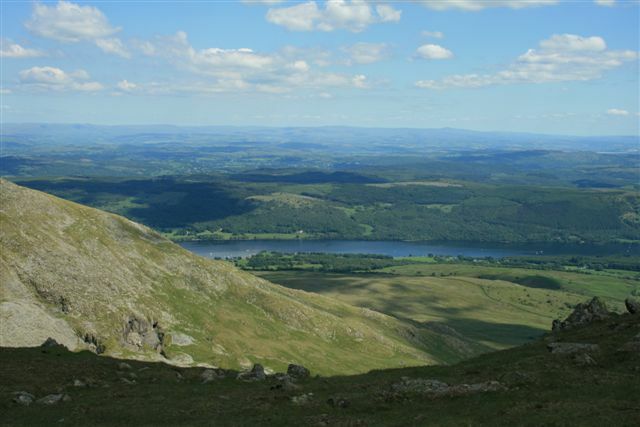 I have named my walk the Ullswater Lake walks, Howtown to Glenridding which will reward you with stunning views of the Ullswater valley and the Helvellyn mountain range. 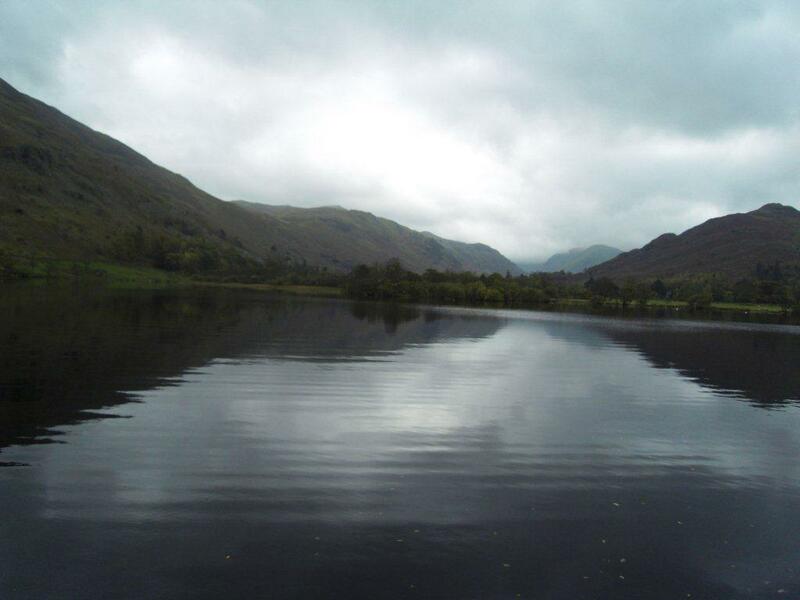 What makes this particular Lake walks special is the different perspective given with the commencement of the walk at the Glenridding pier of the Ullswater Steamer where we embarked. Taking the Steamer ride from the Glenridding pier first check out the time table for the Steamer and allow time for your walk of approximately three and a half hours. 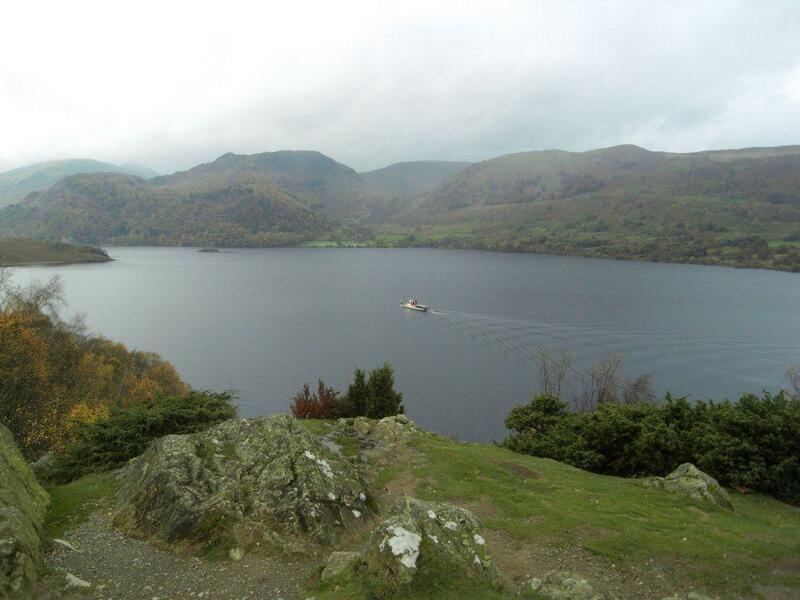 The walk is just over 10 km and should you desire it is possible, time of year and current timetable permitting, to take the Steamer from Pooley Bridge to Howtown inclusive. 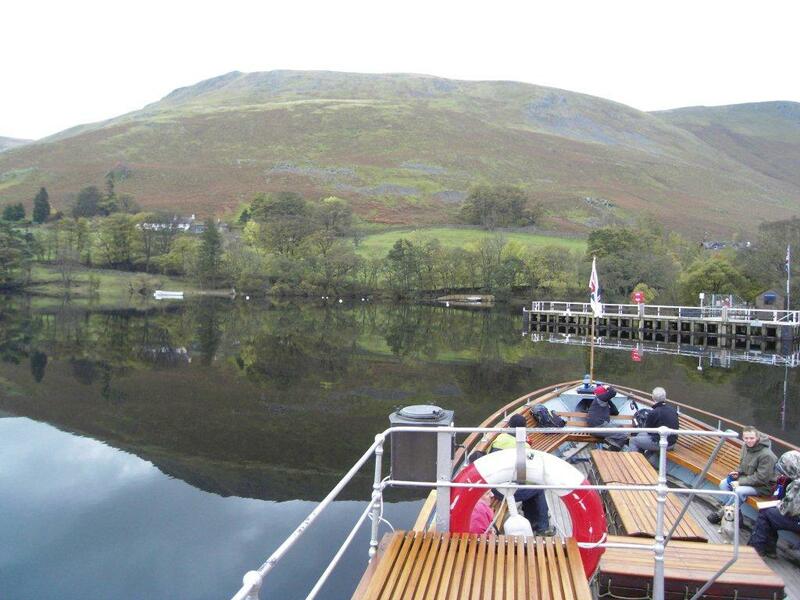 Embarking at Glenridding we travelled Ullswater Lake towards Howtown on a brisk November day with little wind and a mirror like lake. 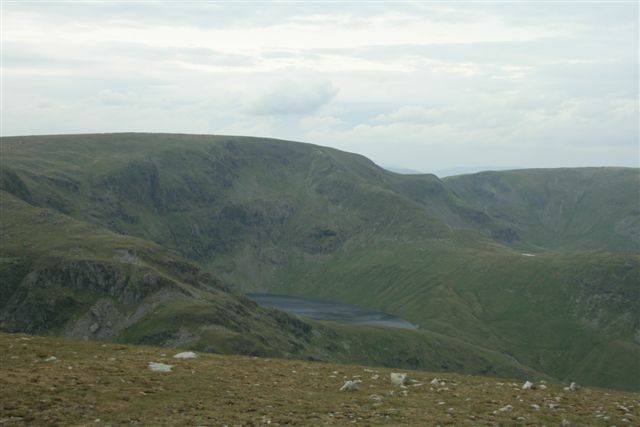 This particular time of year rewards the intrepid walker with a vast array of changing autumnal colours with cold and frosty mornings being particularly good. 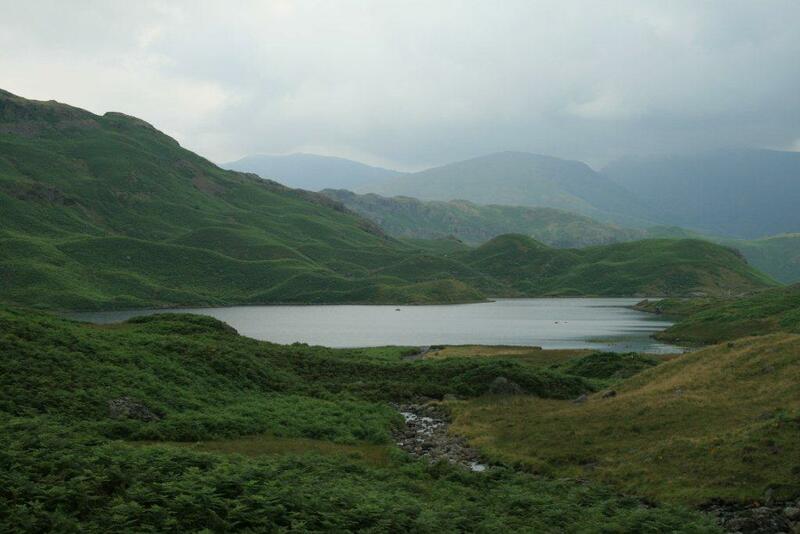 Disembarking at Howtown we arranged our equipment and for the first time we used our Lake District walks Handheld GPS ( follow link for our way points route and map ) which I have to say was excellent. 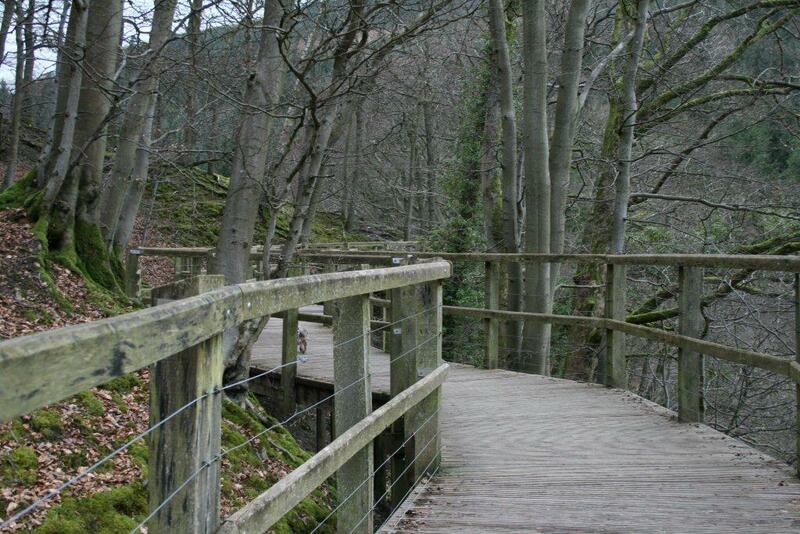 Upon leaving the pier the path is clearly visible to your right and a good quality path takes you over a small bridge. 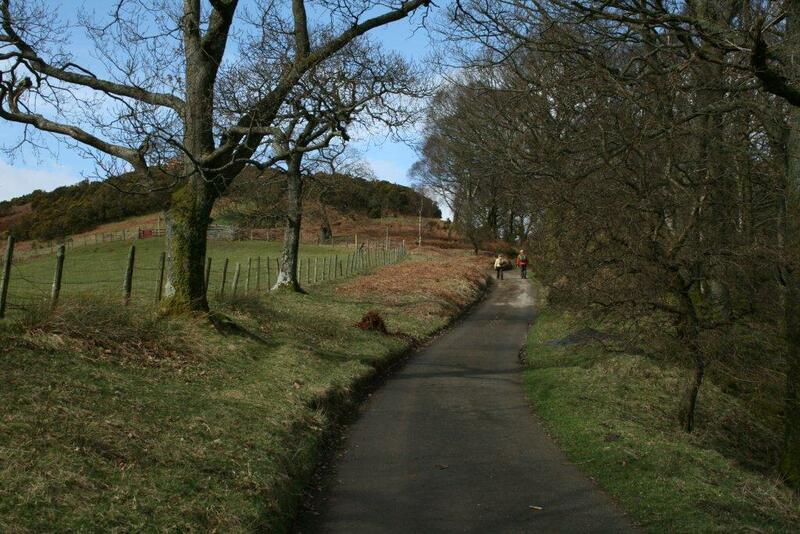 The small footpath will take your towards a single track road servicing a home. 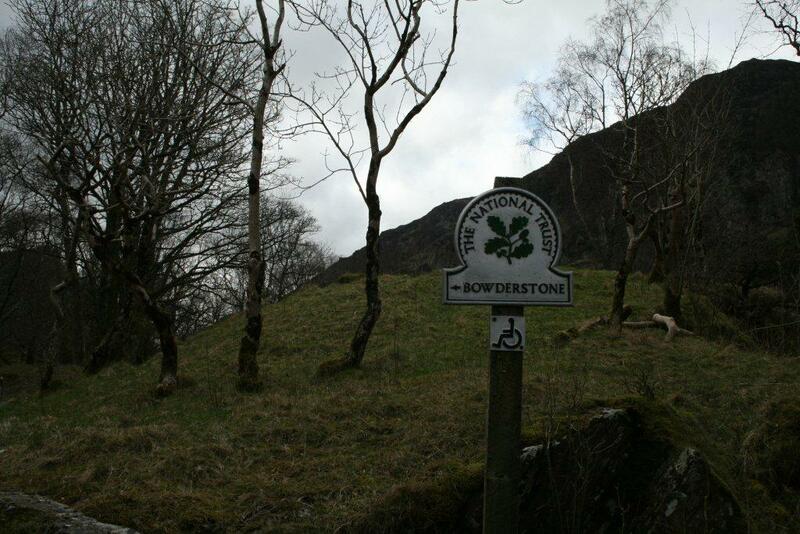 Walking a short distance along the road a sign post for Patterdale Sandwick will be visible taking you a short distance towards the slightly inclined steps with a stone wall to your right and then through a swing gate. 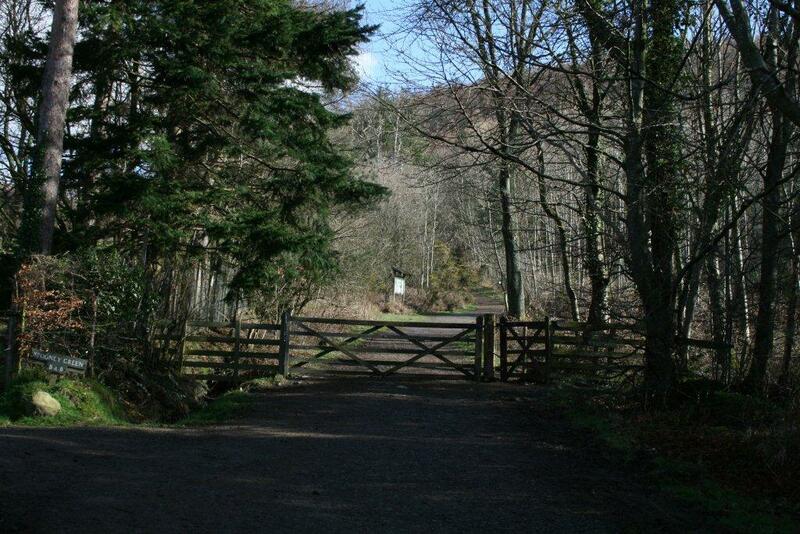 Once through the gate the path splits and taking the right hand path this will keep you on the Lake walk leaving Howtown. 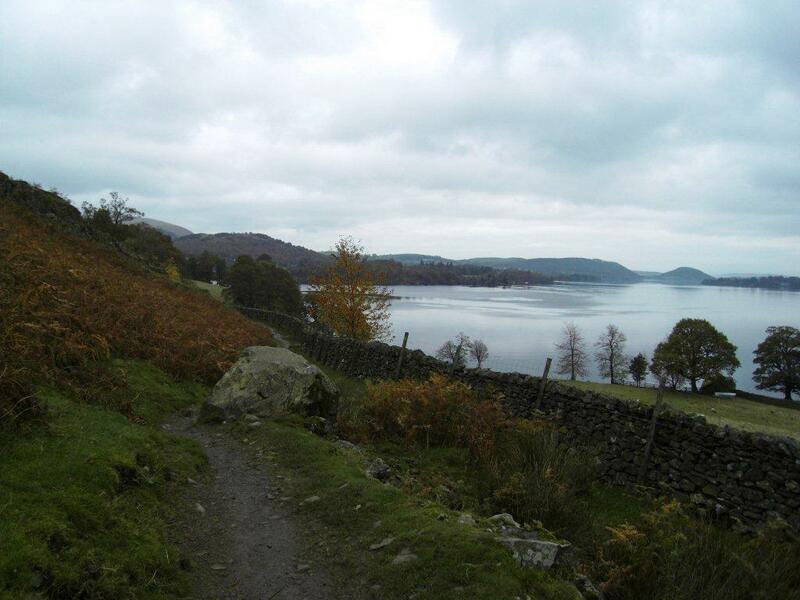 This new section of the walk will reward you with clear Lakeland views across Ullswater Lake and towards Pooley Bridge. 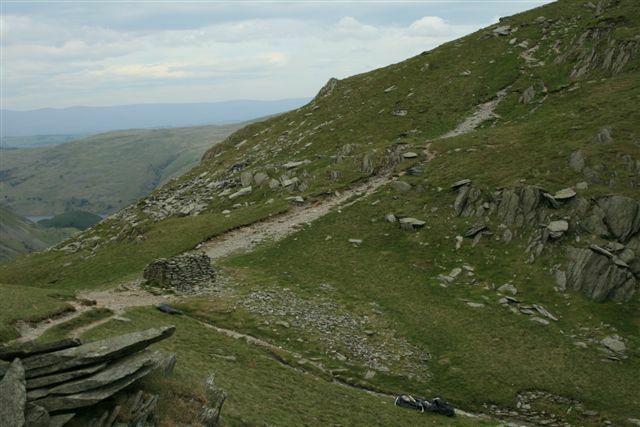 The footpath at this point is well maintained and generally dry in most weathers. 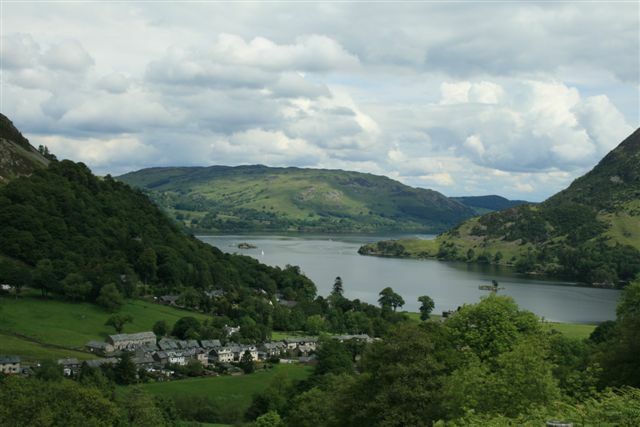 From your vantage point at this stage of your Ullswater Lake walk it is possible to make out the stunningly beautiful Aira Force Waterfall set upon the opposite Western shore of Ullswater. 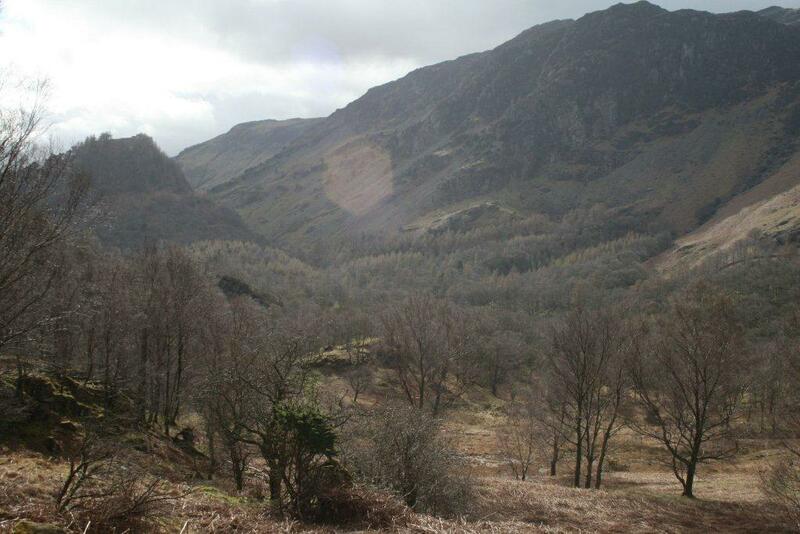 Whilst also not forgetting that the daffodils still grow in the spring time at Glencoyne Bay close to Aira Force, when William Wordsworth wrote what later became the most famous poem in the English language. 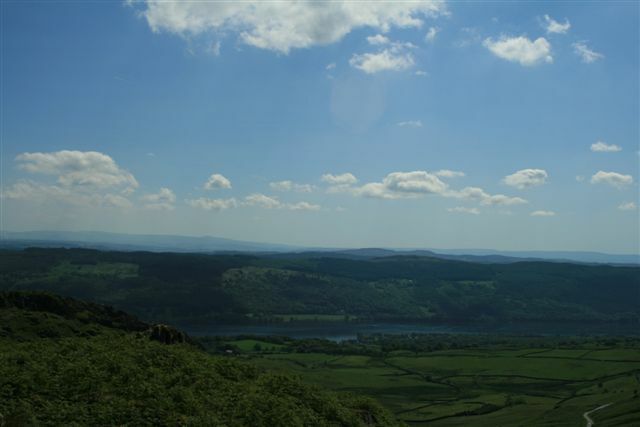 Poet I will never be, although with measured motion I struck again and struck again my feet upon the ground continuing onwards with stone wall upon my right and arguably England finest lake upon my right. 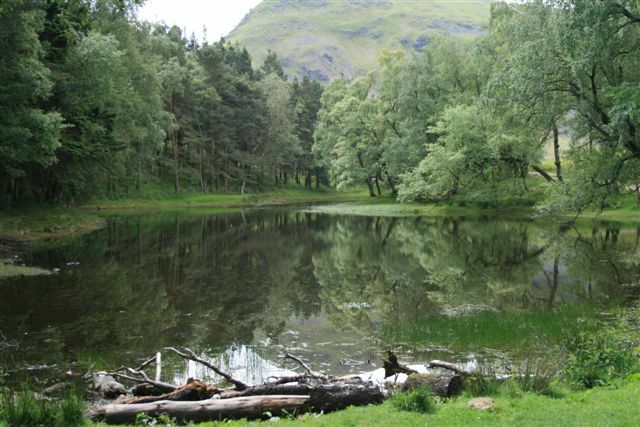 With the path now heading southwards you will find several delightful spots with close access to the lake and possible spots for cooling the feet on a hot summer’s day with paddling or a spot for the dog to chase stone thrown into the still waters. 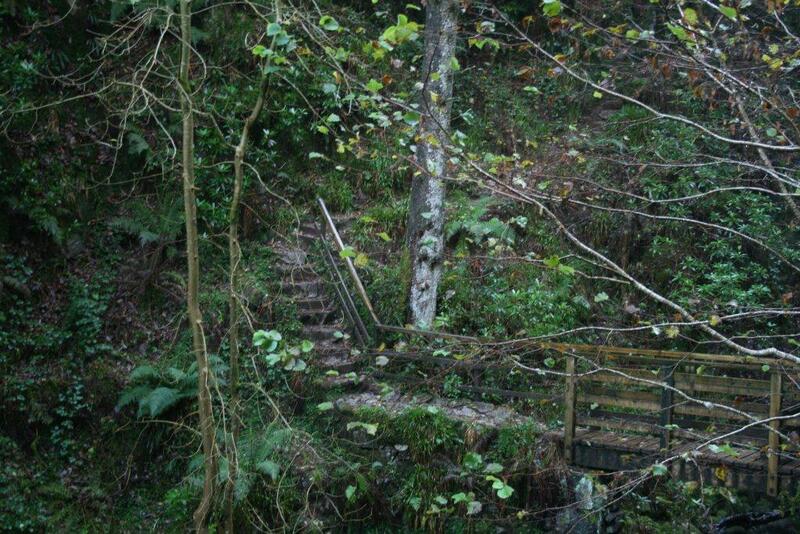 Leaving the water’s edge with a gentle climb upwards you will enter Hallinhagg Wood where the footpath becomes uneven and you may catch a glimpse of a Red Squirrel or two here. 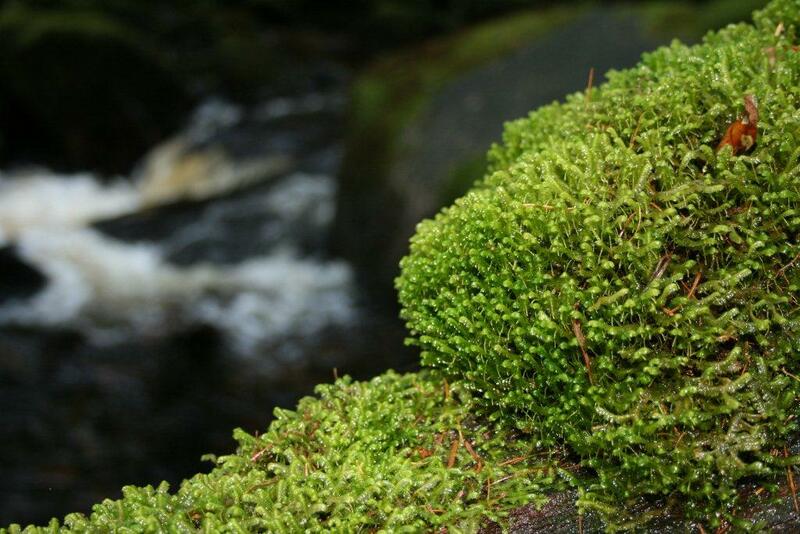 Upon spotting the odd felled tree with some of the off cuts piled in some format of organised chaos this practice is undertaken to help Hedgehogs in creating slow rotting environments for our woodland animals. 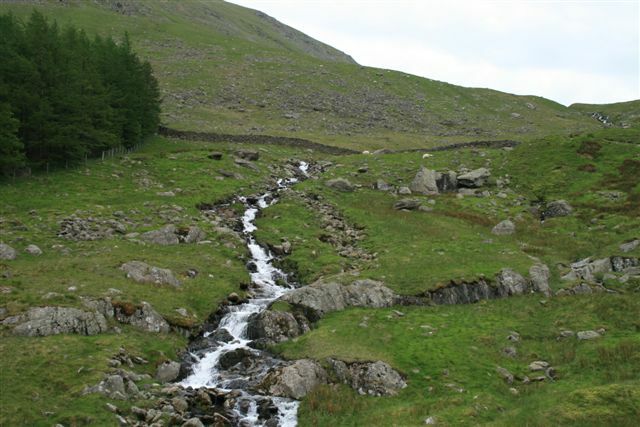 With the beck now upon your right which meanders down to Silver Bay continue onwards away from Ullswater towards Beck Side Farm and Sandwick. 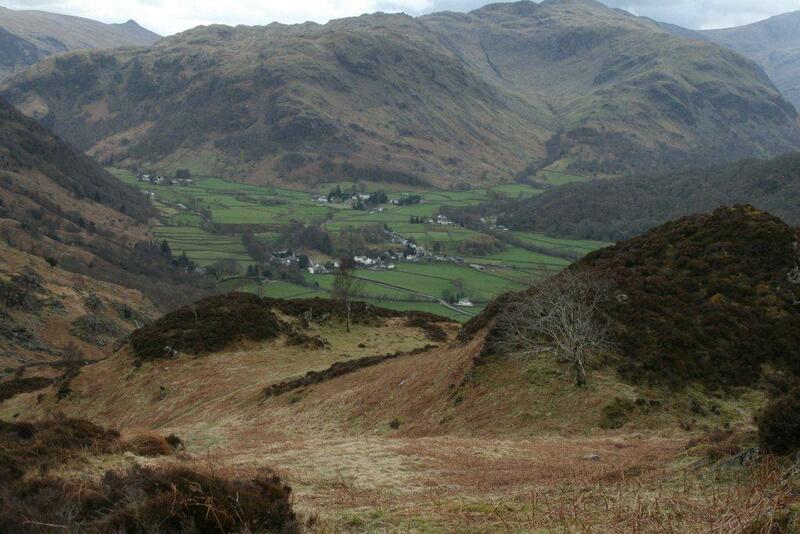 Follow the path which is situated to the left of Townhead Cottage sign posted Patterdale. 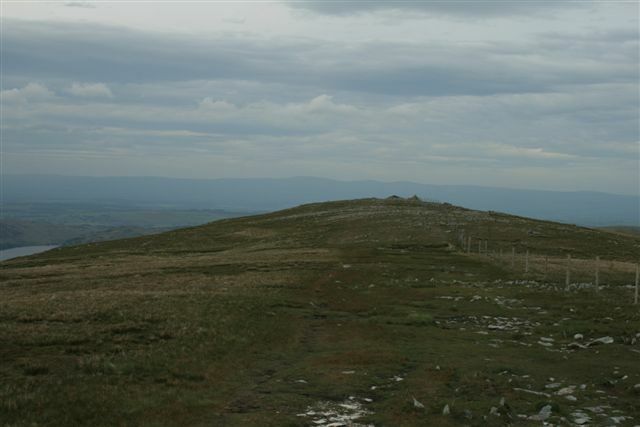 As you now traverse Silver Crag it may be possible to see Lyulph’s Tower which is a 16th Century castellated building situated near to Gowbarrow Fell which will be behind you as you walk forwards. 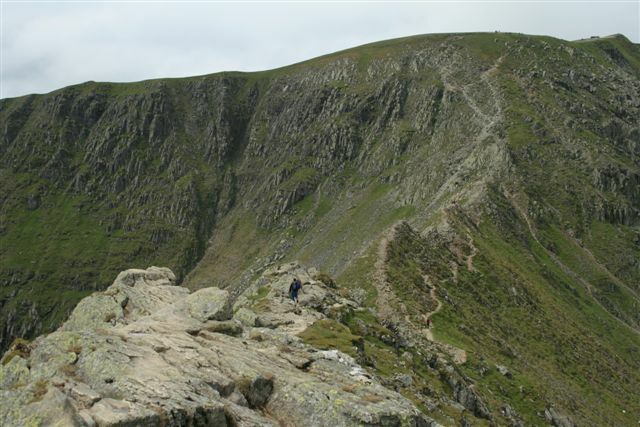 Moving forwards and coming into view will be the Helvellyn mountain range and possibly Helvellyn Via Striding Edge which I have to say is one of my personal favourite high level walks (adventure). 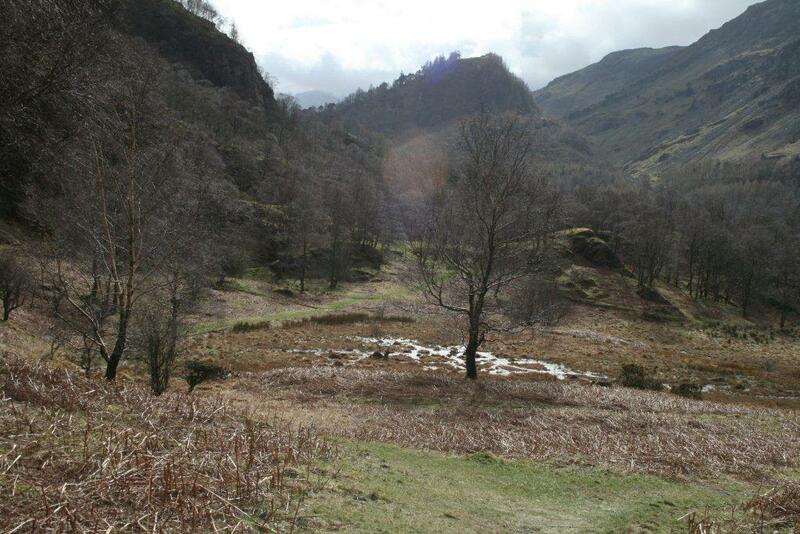 With the path now continuing towards Patterdale it gradually turns into a farm track and from here you can recall the start of your walk from the Glenridding Steamer pier on the now opposite shore. 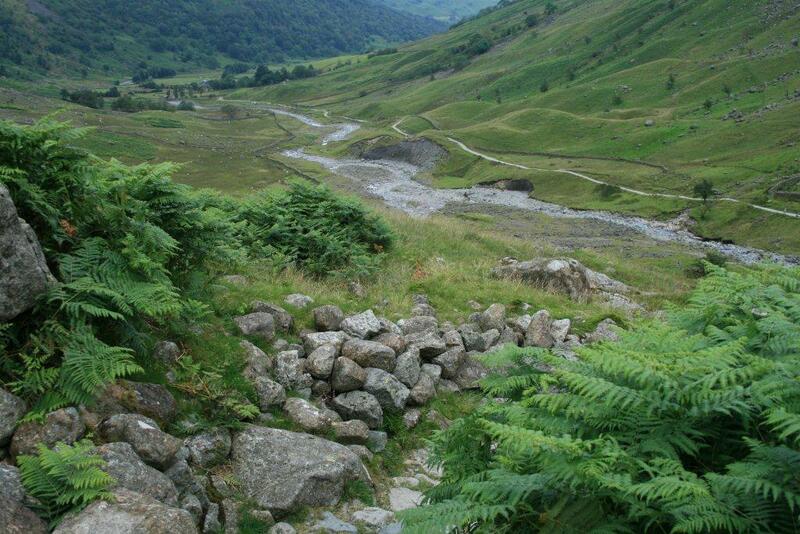 Upon reaching the farm continue along the track as it heads towards the Goldrill Beck and the main road as it returns you on your Ullswater Lake walks back to the Glenridding pier. 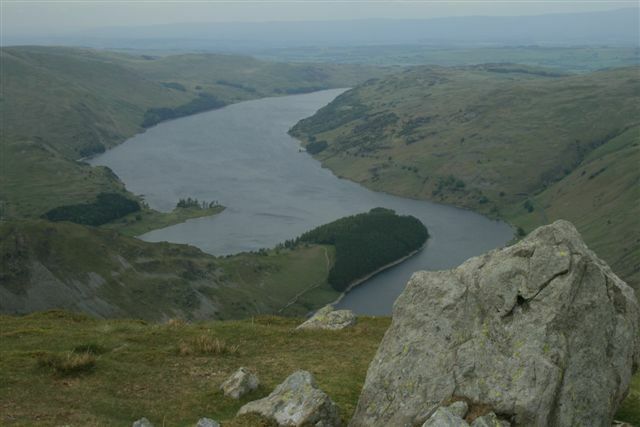 Should you wish to see better quality photographs of this Ullswater Lake walks please visit Ullswater Lake Walks on our Lake District Walks Flickr account. 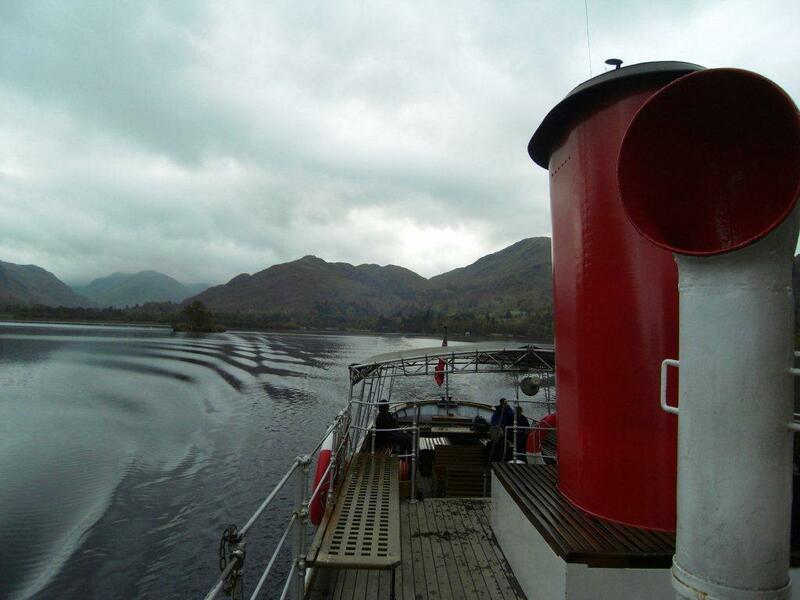 I hope you enjoyed my Ullswater Lake walks using the Ullswater Steamer from Glenridding to Howtown and the walk back, please hit the like buttons below. Cat Bells is majestically poised above Derwent Water and quite arguably one of the most popular of all the low level Lakeland fell walks at 451 metres (1,480 ft); a mountain in miniature. 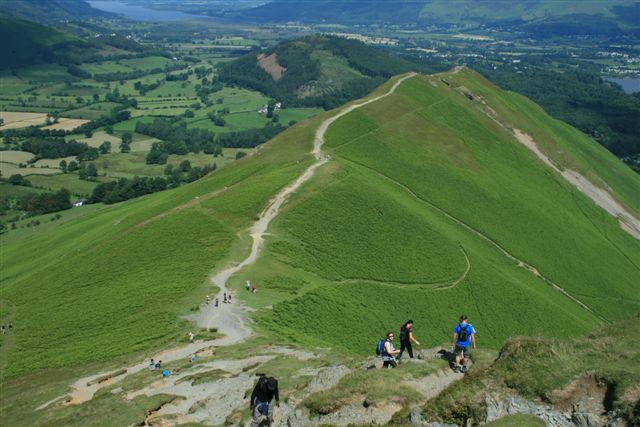 The ascent is well rewarded with breath taking views over Derwent Water to the east and the Newlands valley to the west and back over the town of Keswick to Skiddaw and Saddleback (Blencathra walk), although Sharp Edge is not visible. 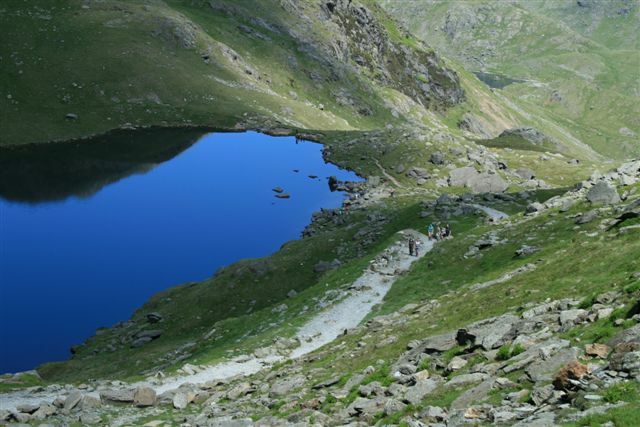 “it is one of the great favourites, a family fell where grandmothers and infants can climb the heights together, a place beloved. 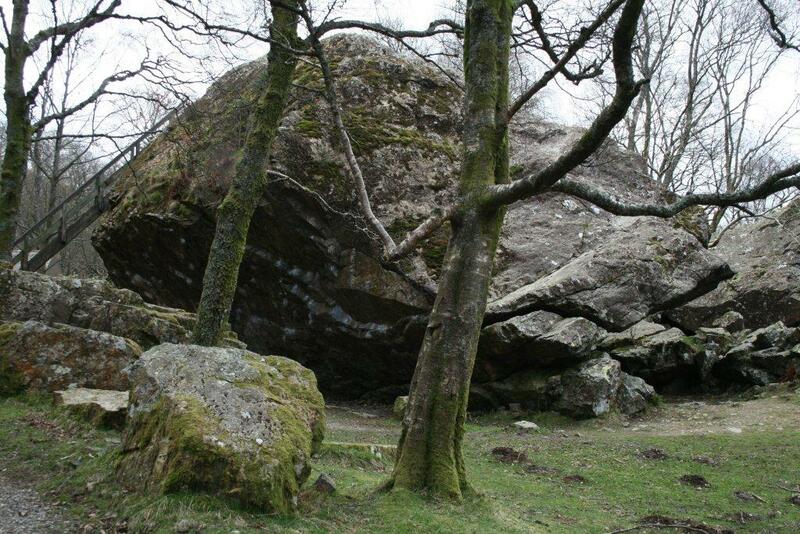 Its popularity is well deserved, its shapely topknot attracts the eye offering a steep but obviously simple scramble”. 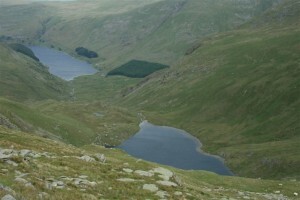 Sometimes it is hard to fathom why generation after generation certain walks remains ever popular, although some are immortalised by writers such as Wainwright and Beatrix Potter into the national heritage and I believe it is good to know why these walks have become shrine like to those seeking the outdoors. 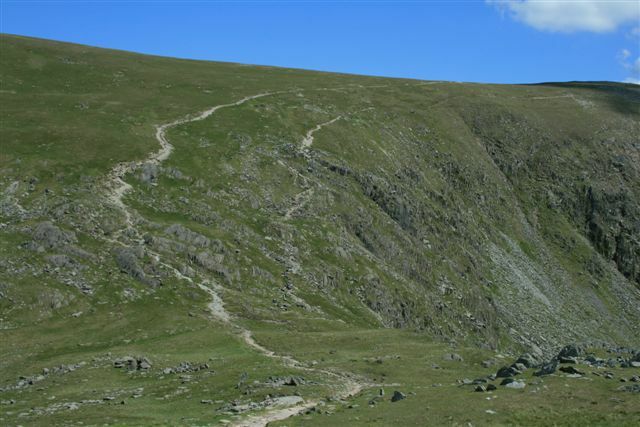 To have the wind blowing in your face and knowing the famous have walked these very same footpaths gives food for thought. 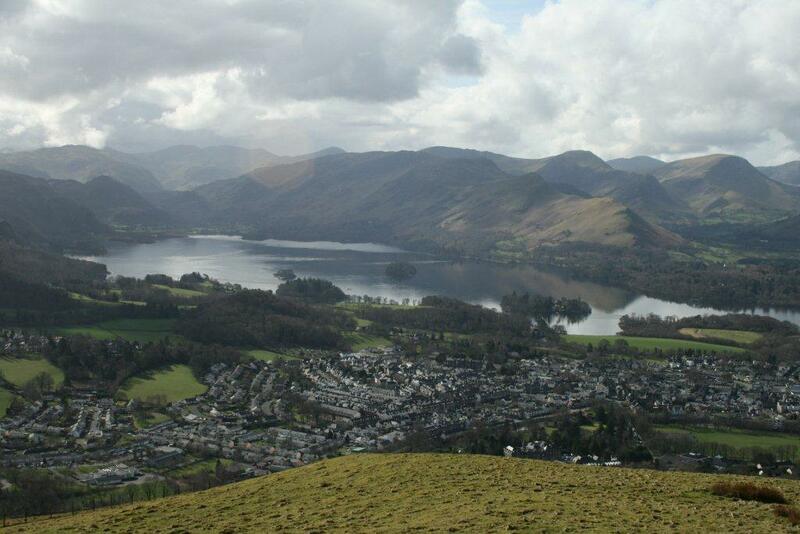 For those with long memories or young children will be interested to learn that Cat Bells was the home of Mrs Tiggy Winkle. 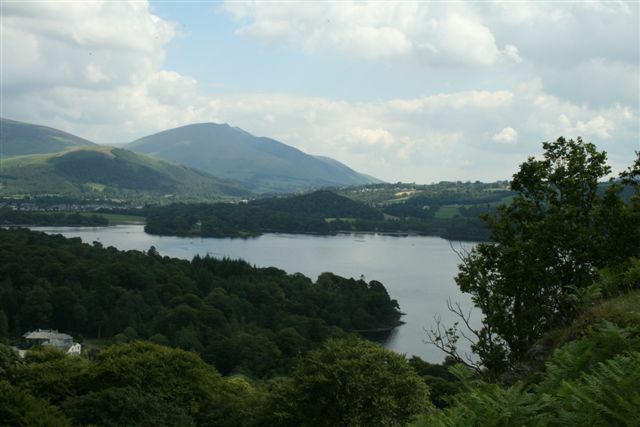 With several of Beatrix Potter’s earlier publications drawing their backgrounds from the area around the Newlands valley and Derwent Water, where Beatrix Potter spent several summers before 1903. 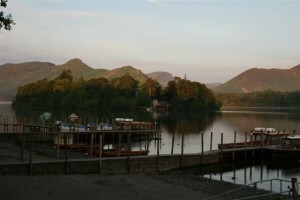 The Tale of Squirrel Nutkin (1903) was inspired by the red squirrels which still frequent the woods on the shores of Derwent Water, Owl Island where Old Brown lived in the story being St Herberts Island. The connection is strongest with The Tale of Mrs Tiggy Winkle (1905). 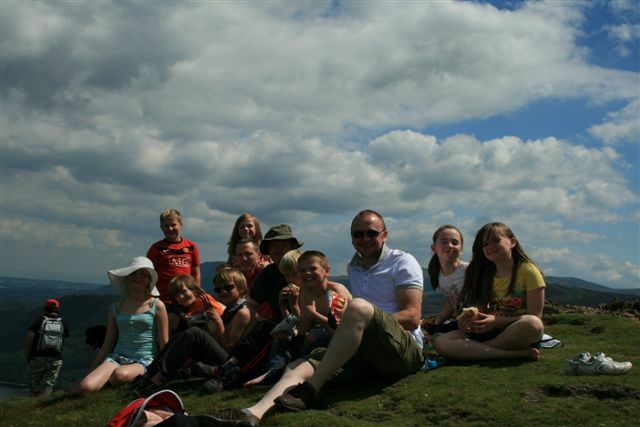 This story is about a small girl called Lucie who lives at Little Town in Newlands. One day she meets washer woman (or washerhedgehog!) 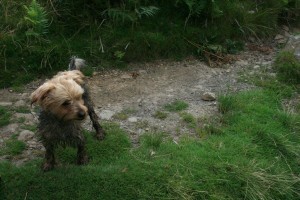 Mrs Tiggy Winkle, who works in a kitchen behind a small door on the side of Cat Bells. 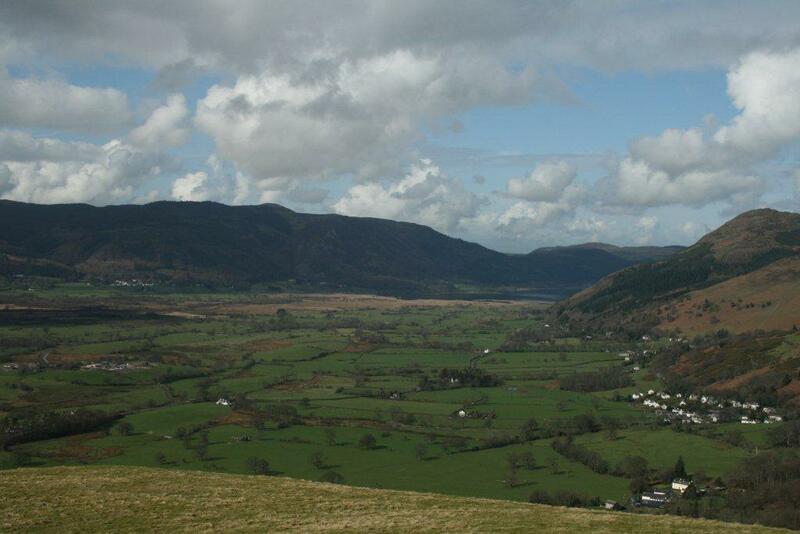 The real Lucie being a daughter of the vicar of Newlands whom Beatrix Potter met on her visits here. 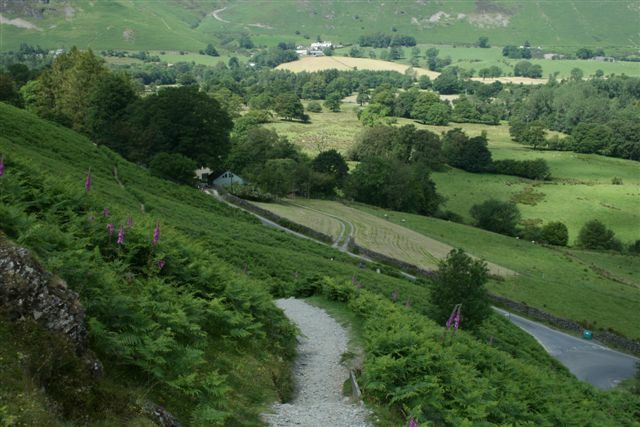 Cat Bells has long had its historical deep rooted past which brings people of all ages back time and again to walk these well-trodden footpaths. 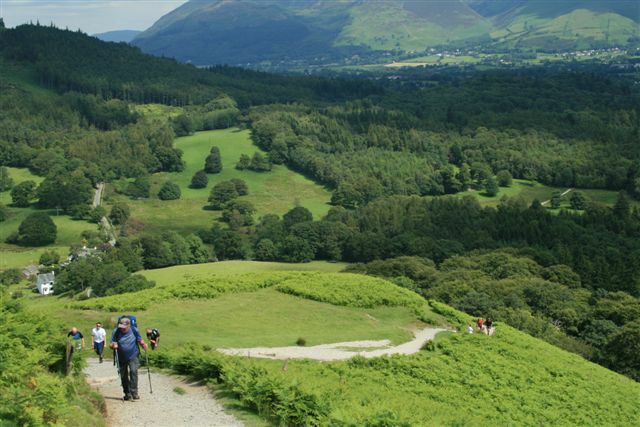 There are those who walked Cat Bells with their parents and return with their children and it is this lifelong connection which I believe makes such walks as Cat Bells part of the national heritage of walks if there was such an accolade. 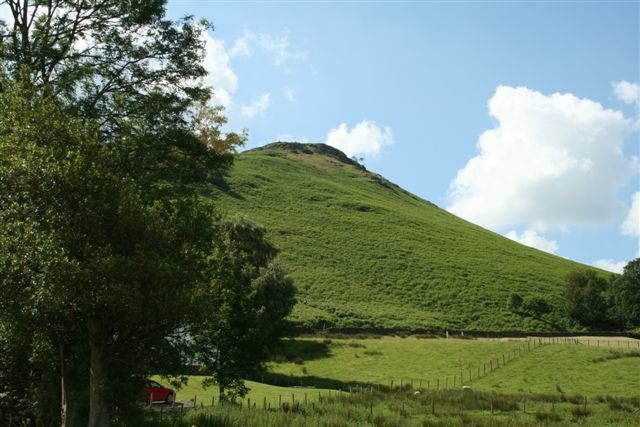 There is ample parking around the base of Cat Bells and usually a farmer’s field wherein you may park, with currently a very reasonable £3 for the day fee for the privilege. 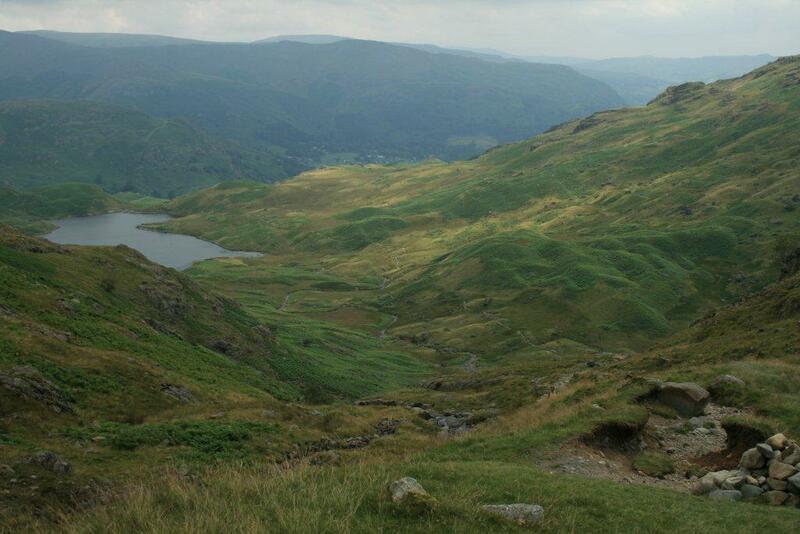 From here you will clearly see the ascent of Cat Bells directly in front of you and the cattle grid. 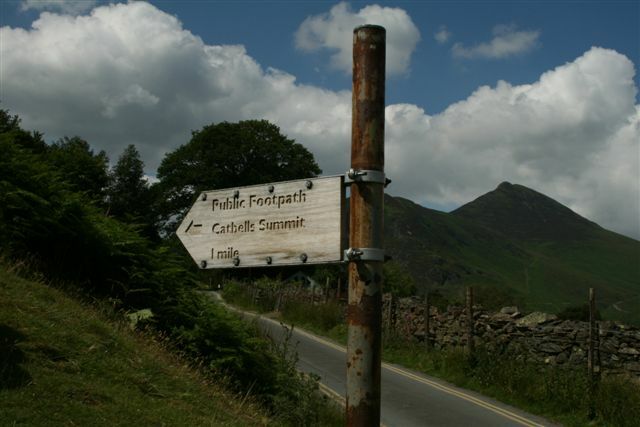 There is a wooden footpath sign at the road junction which clearly indicates the start of the route. 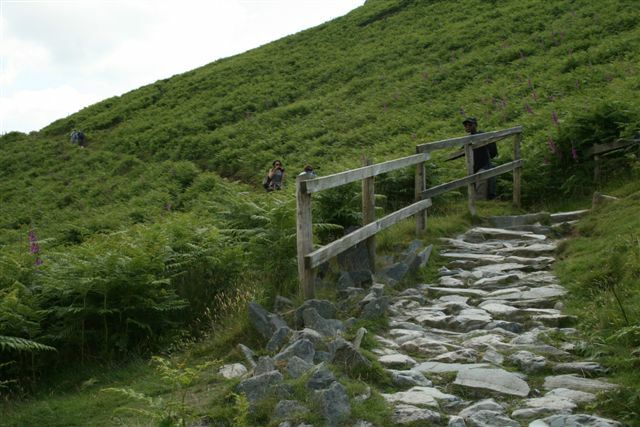 Leaving the road you will see a wide bridleway track to start with before the path commences to climb very steeply through the zig zags. 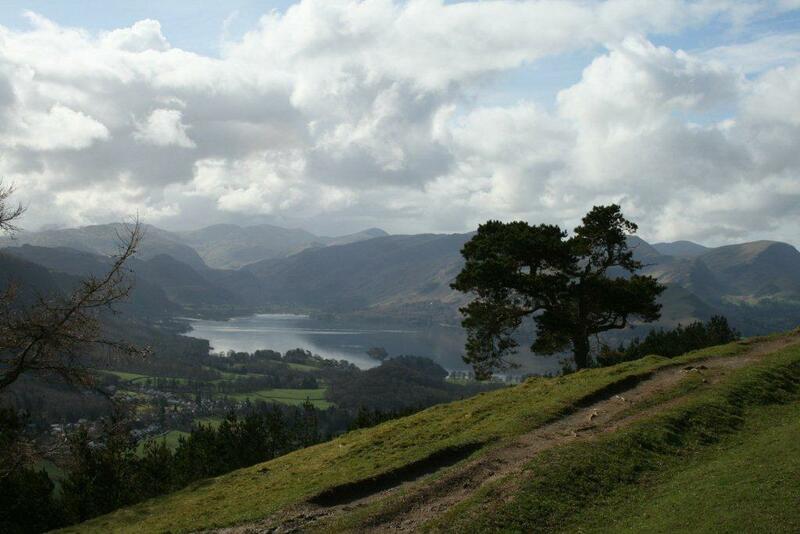 Very quickly you will start to climb and Derwent Water will come into plain view and the higher you climb the more of the Lakeland panorama comes into view. 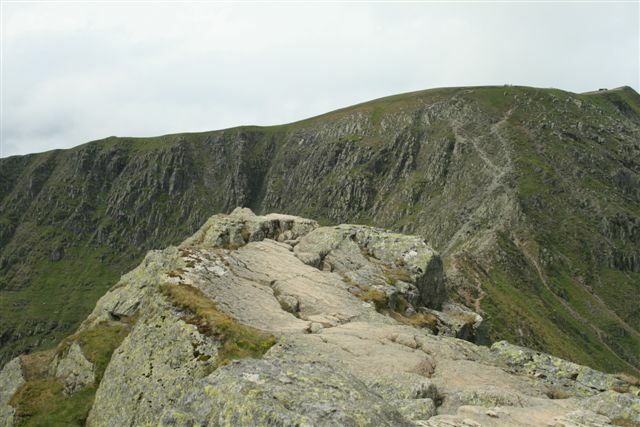 A memorial tablet will be passed for Arthur Leonard (founder of the Co-operative and Communal Holidays and ‘Father’ of the open-air movement) and eventually you will reach the first summit. 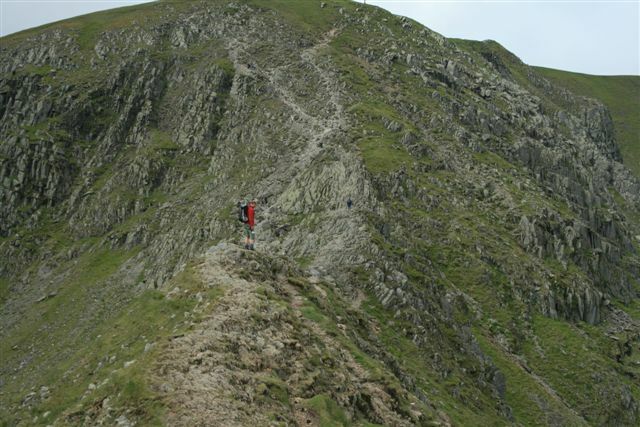 The footpath continues onwards and upwards along an undulating ridge to a final climb to the summit of Cat Bells. The summit of Cat Bells can be a busy spot in high season and is a great place to swap walking notes with other walkers. 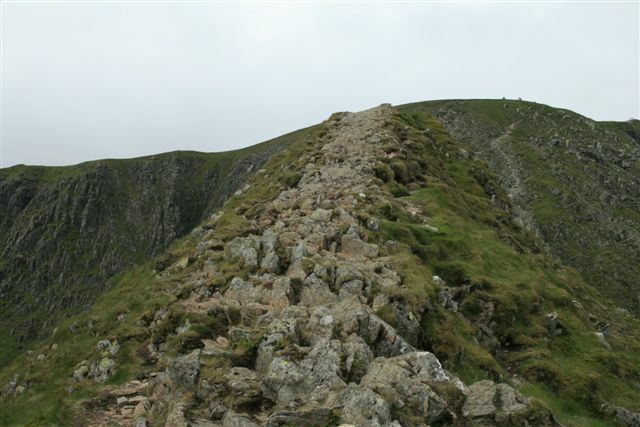 Continuing beyond the summit of Cat Bells following the footpath towards Maiden Moor and at the intersection of the crossroads take the left hand track, whilst descending steeply on a path through the zig zags, there being a fence on short sections. 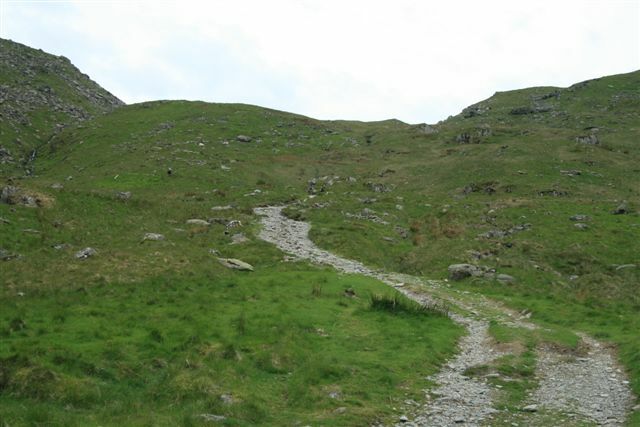 As the track continues downwards it bends towards the right, heading away from your walk starting point, whilst you may wonder if you are going along the correct route as it is unclear at this point where you well make your uturn. 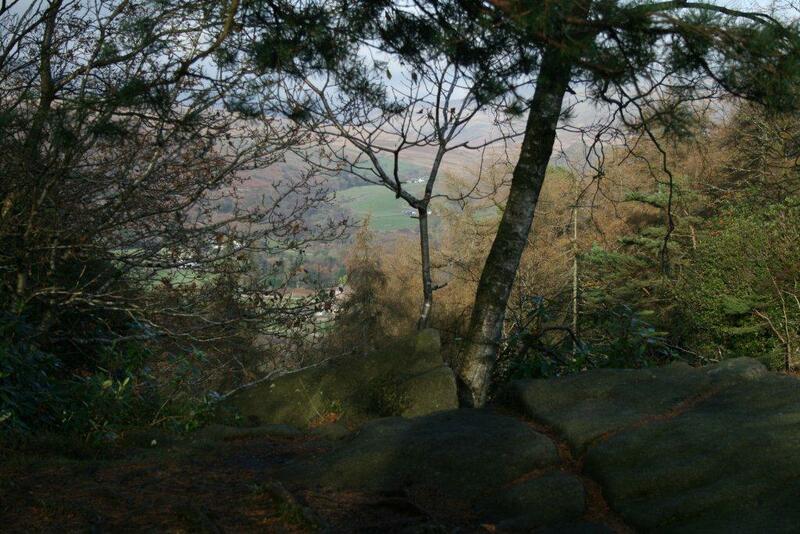 As the path widens the tree line will come into view and a dry stone wall separating the open fell from the trees. 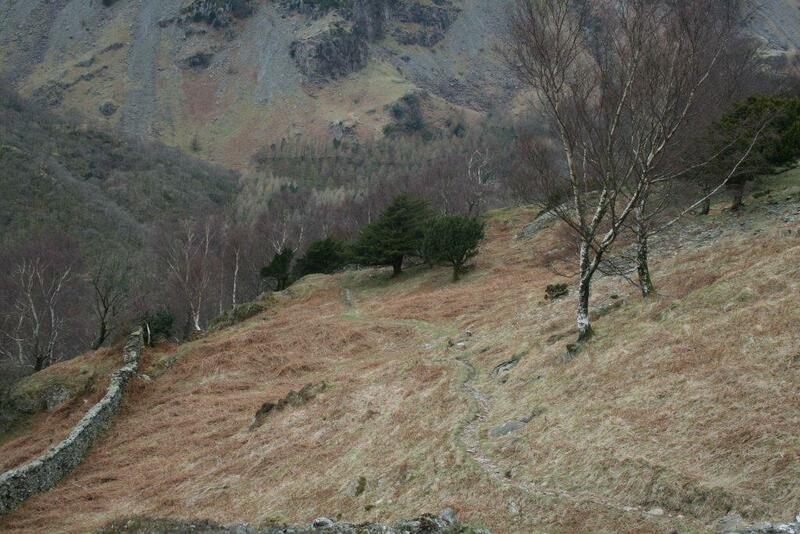 Taking the path leading left which runs along the lower slopes of Cat Bells with superb views over Derwent Water. 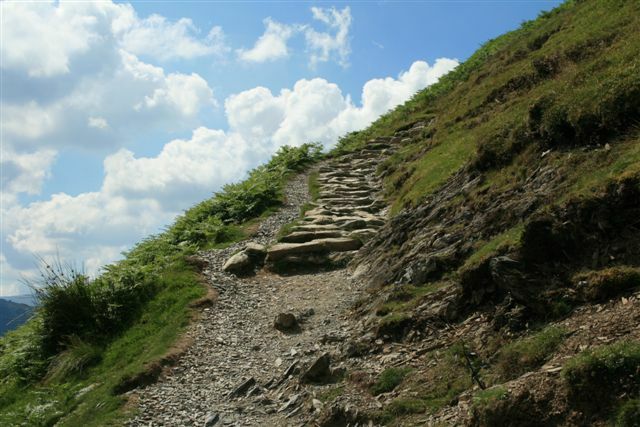 The footpath eventually reaches the road by the quarry, but leaves again, although here you may simply follow the road back to the walk starting point or return to the lower slopes of Cat Bells. 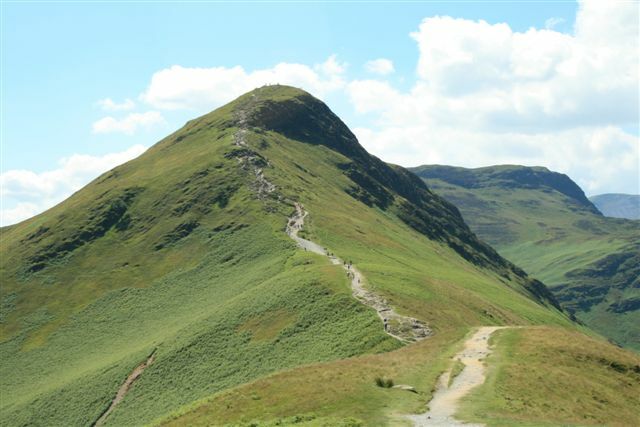 Should you wish to see better quality photographs of this Cat Bells walk article please visit Catbells Walk on our Lake District Walks Flickr account. 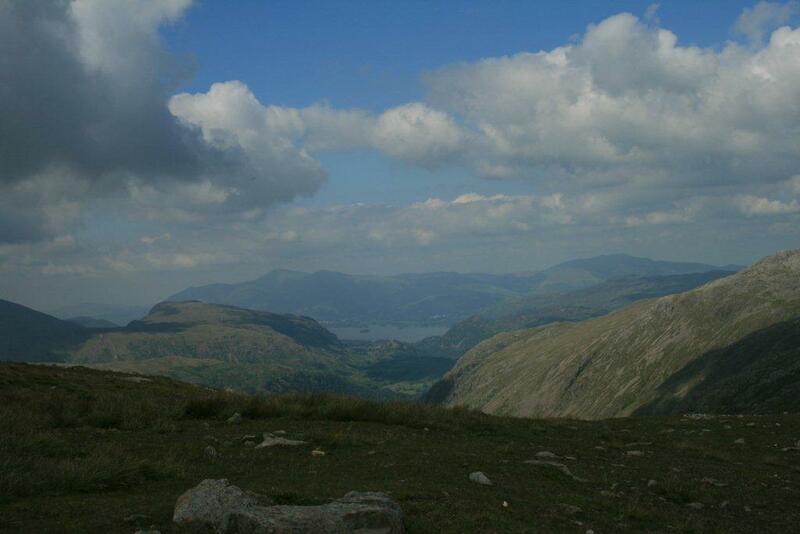 Please feel free to comment below on Cat Bells walk, share or even hit the Face Book like button. 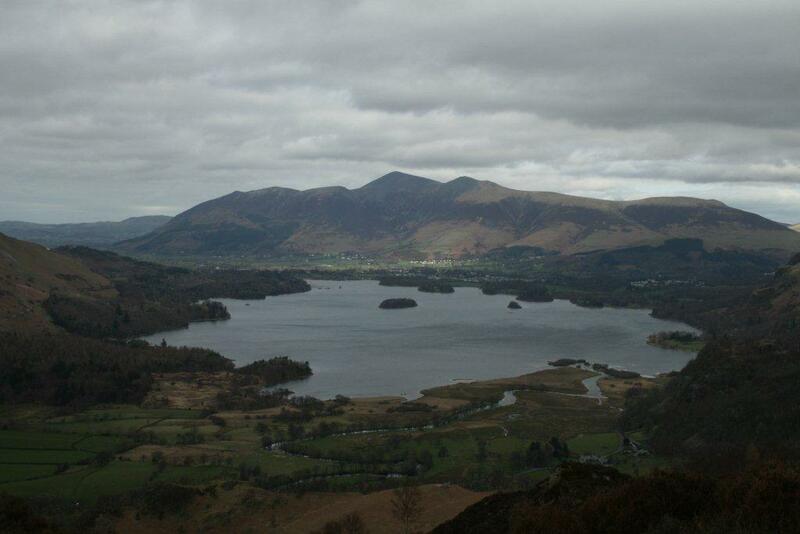 I trust you enjoyed my article on Cat Bells walk.